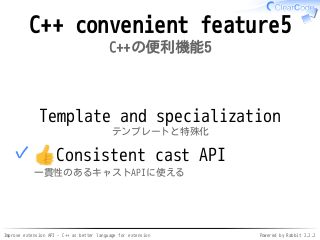 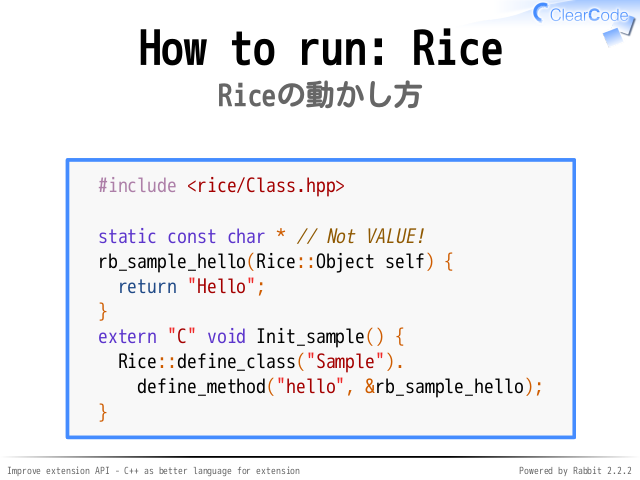 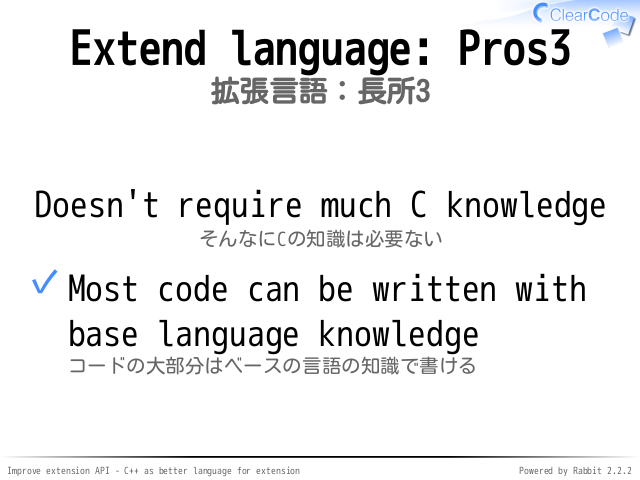 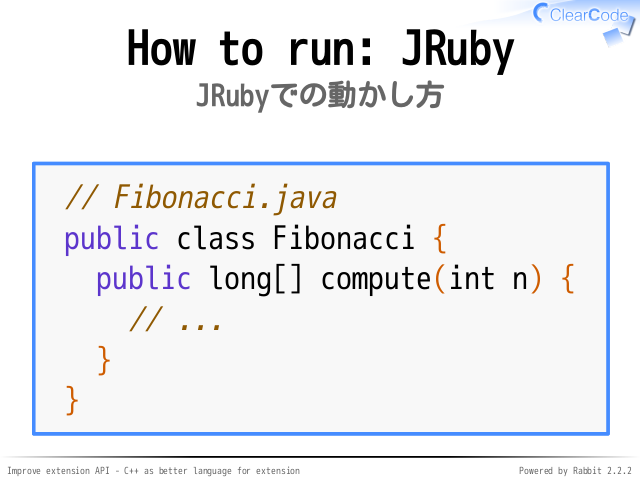 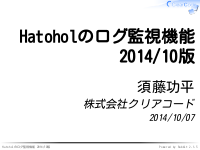 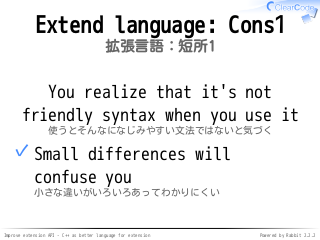 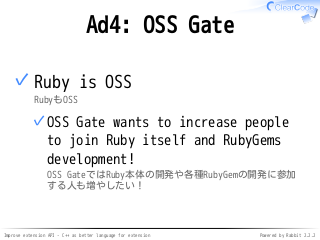 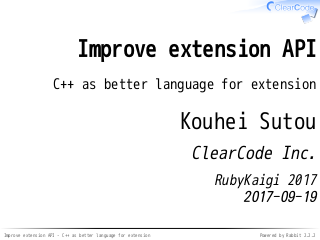 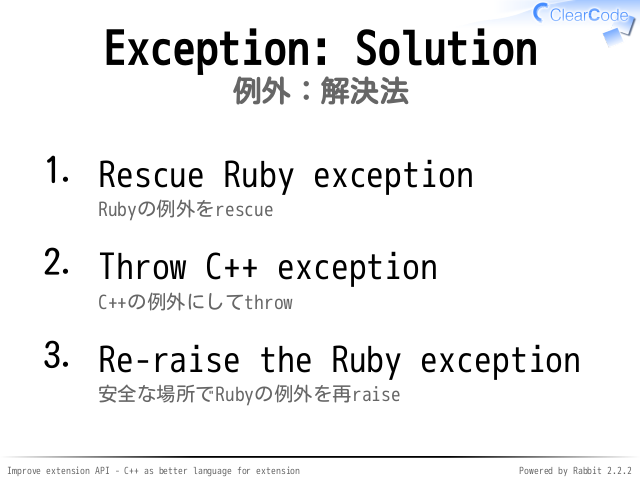 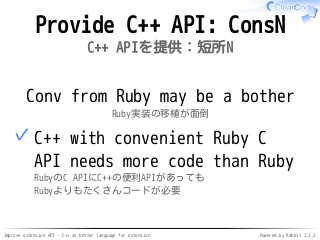 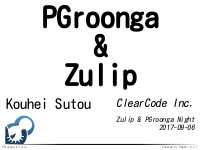 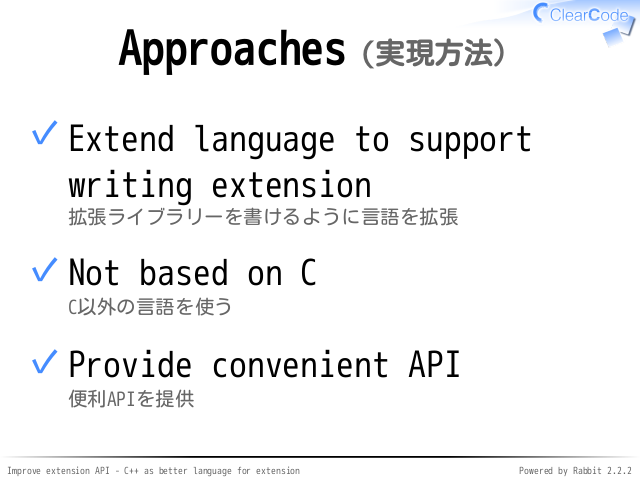 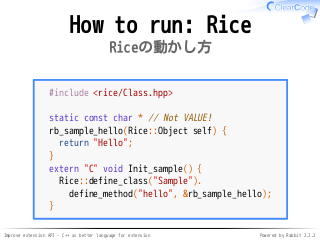 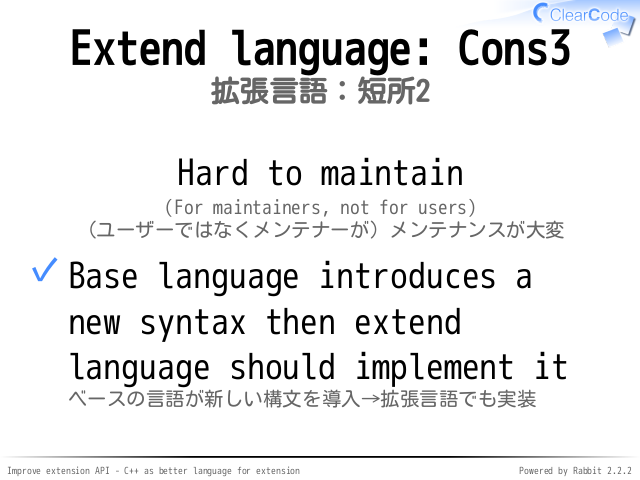 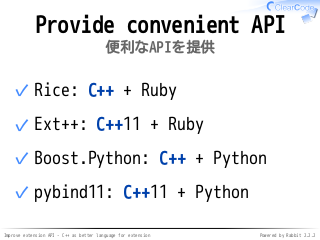 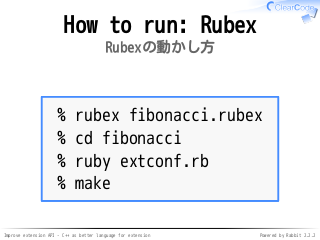 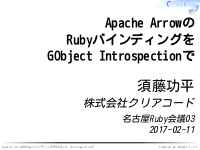 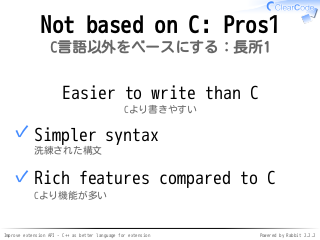 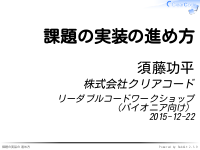 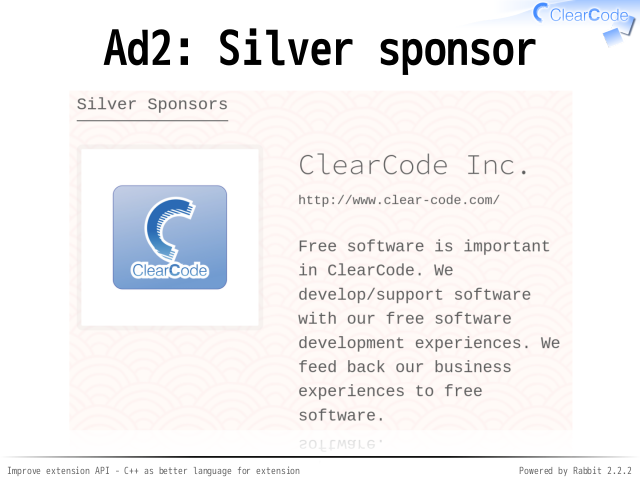 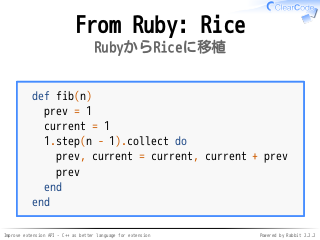 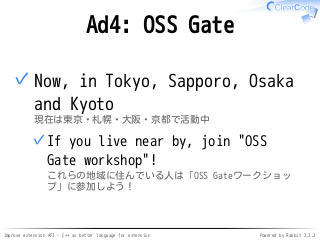 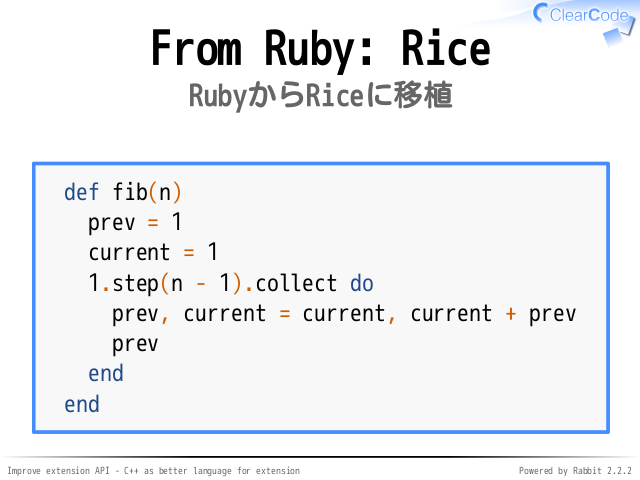 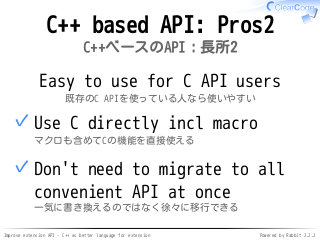 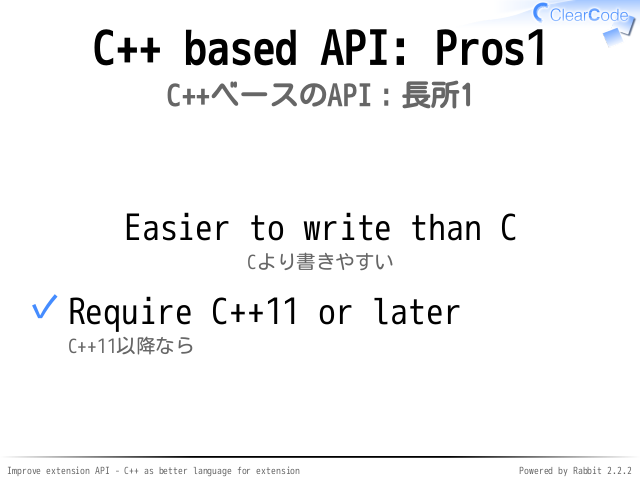 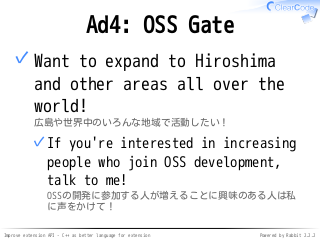 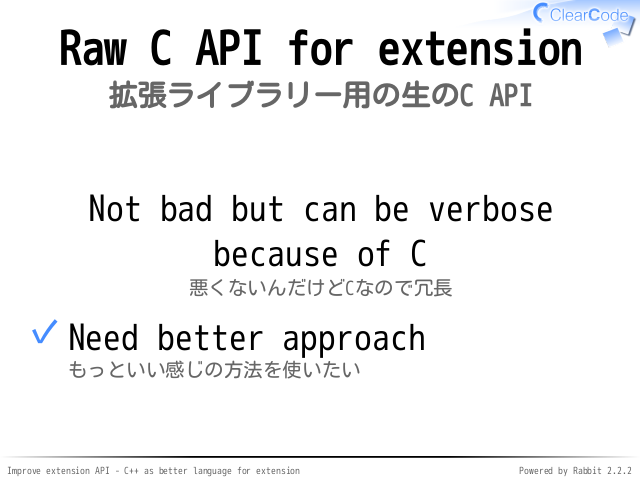 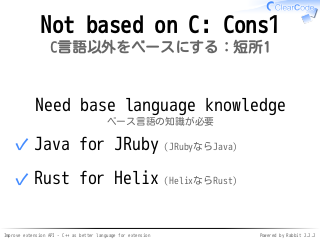 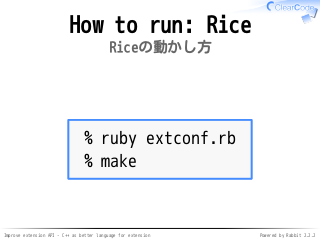 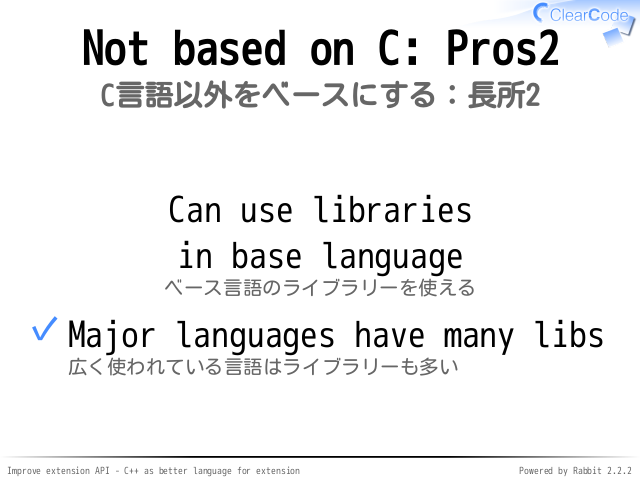 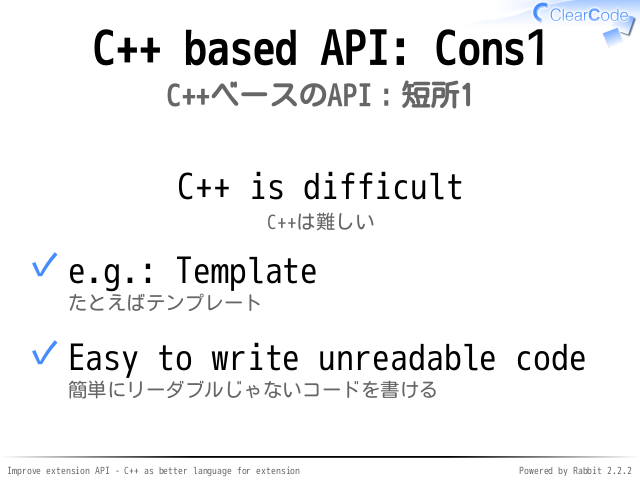 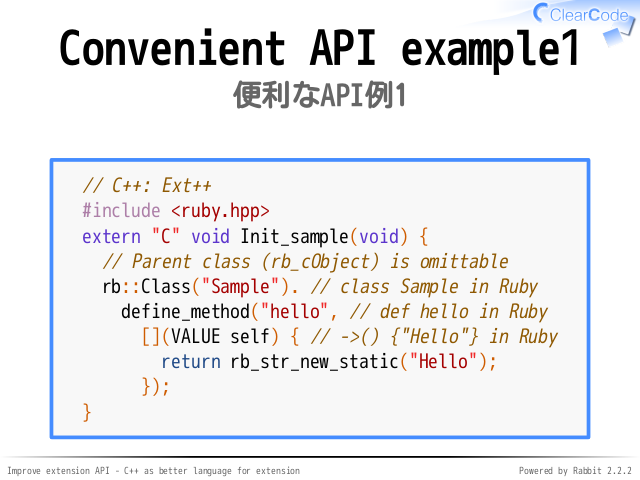 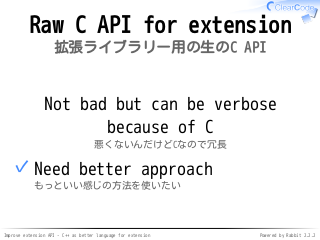 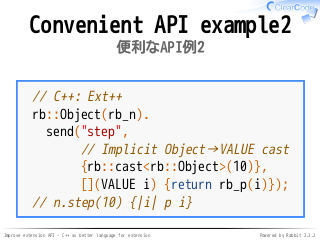 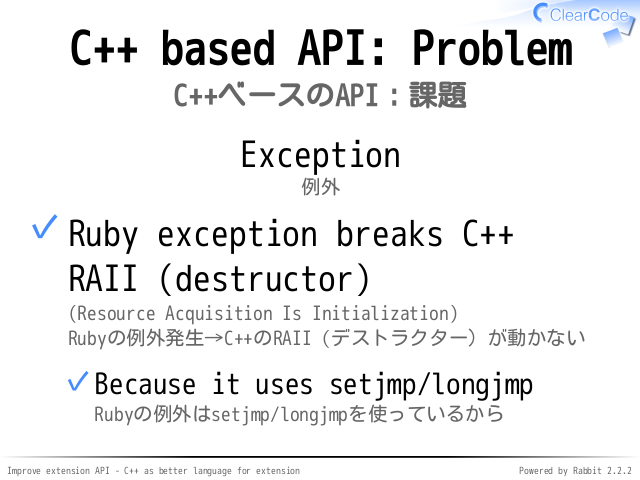 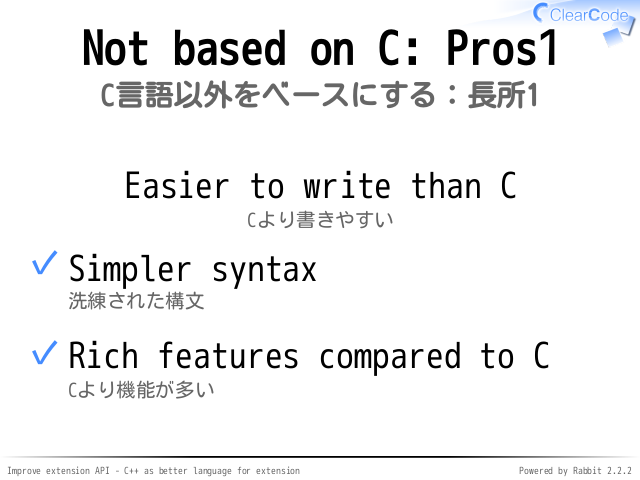 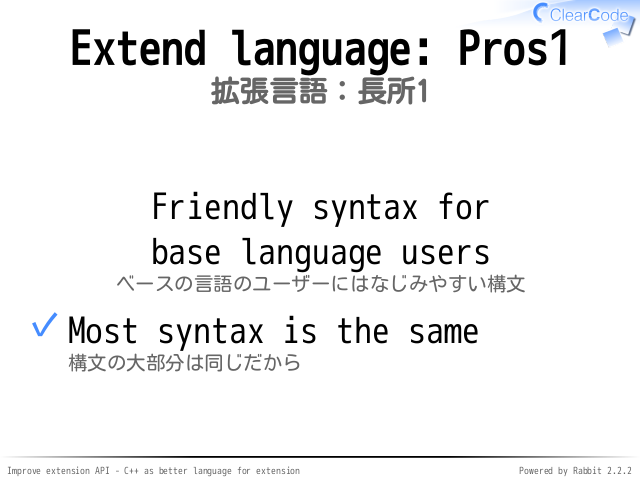 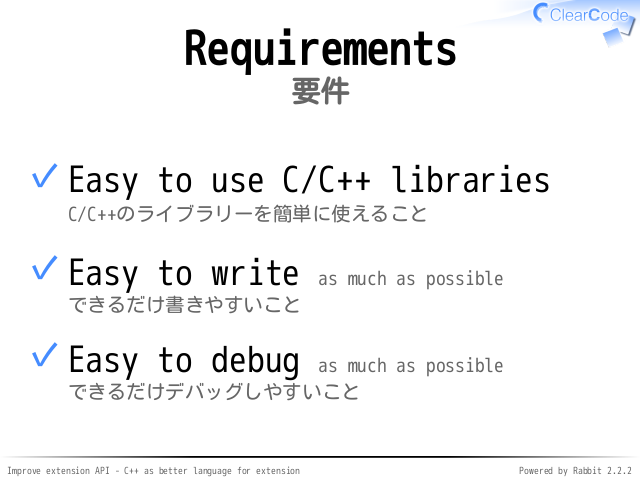 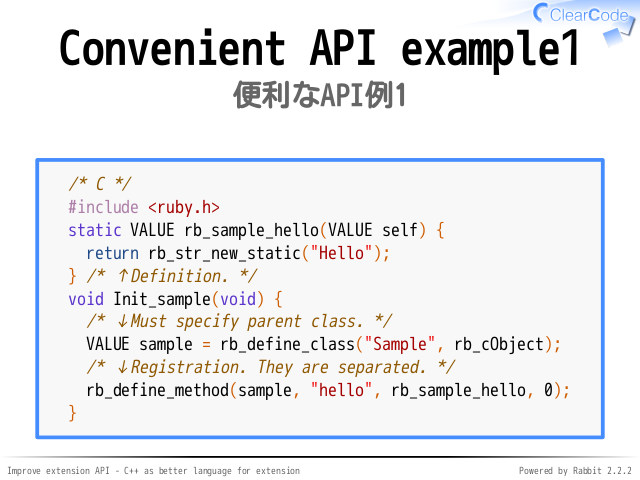 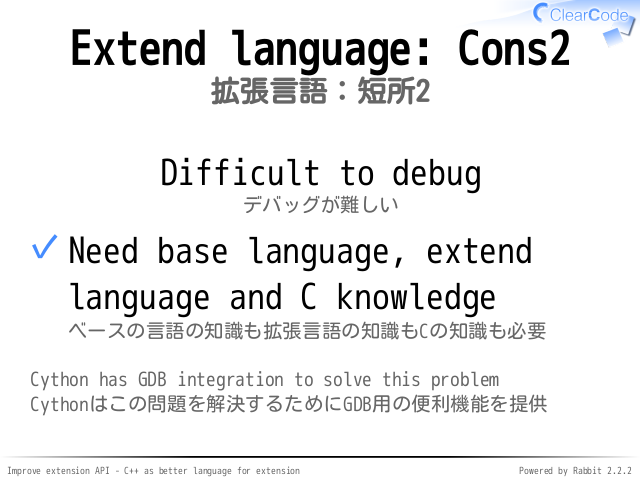 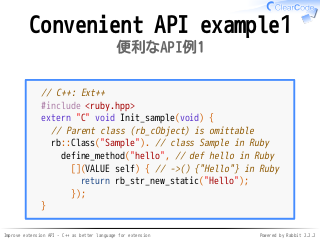 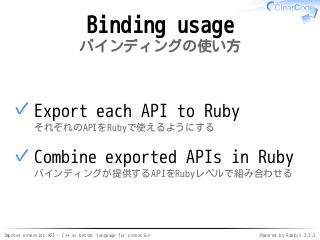 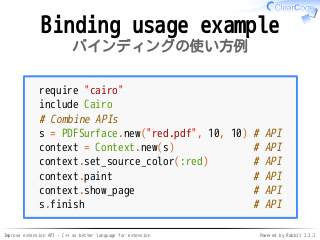 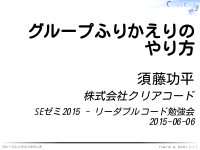 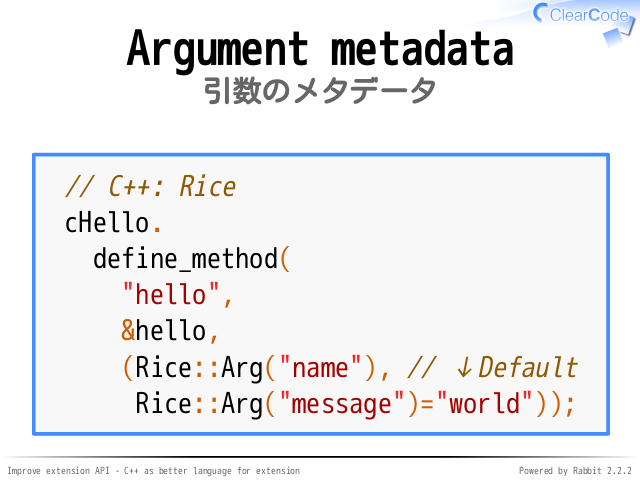 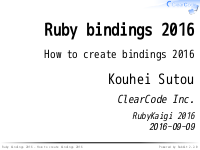 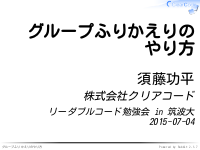 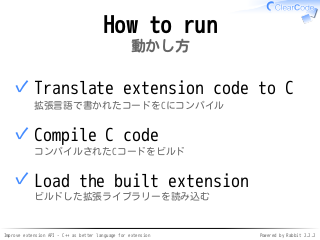 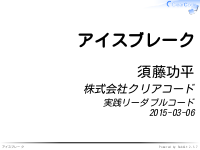 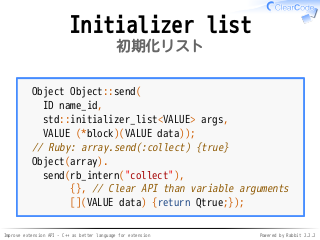 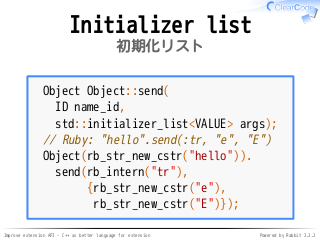 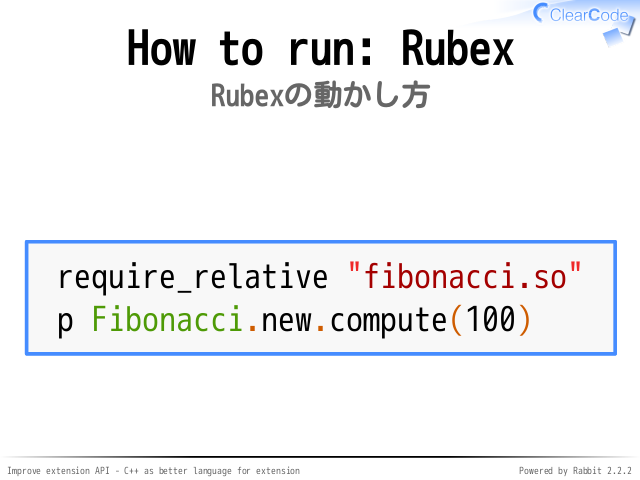 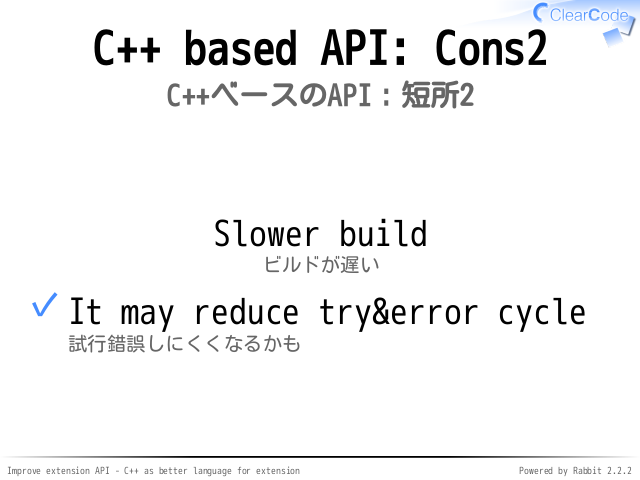 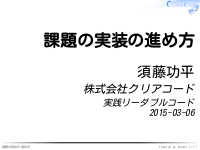 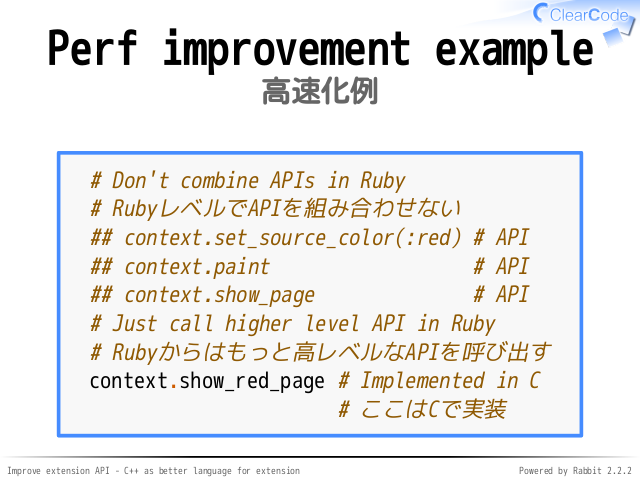 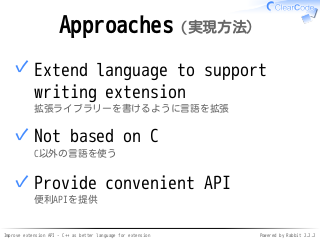 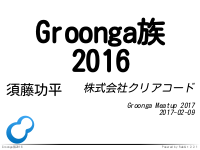 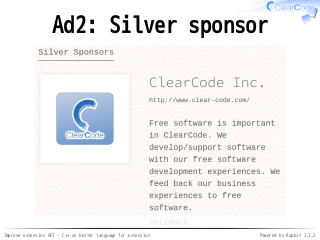 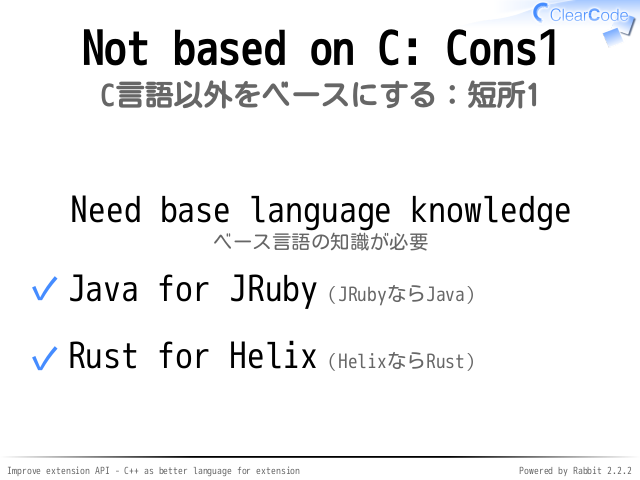 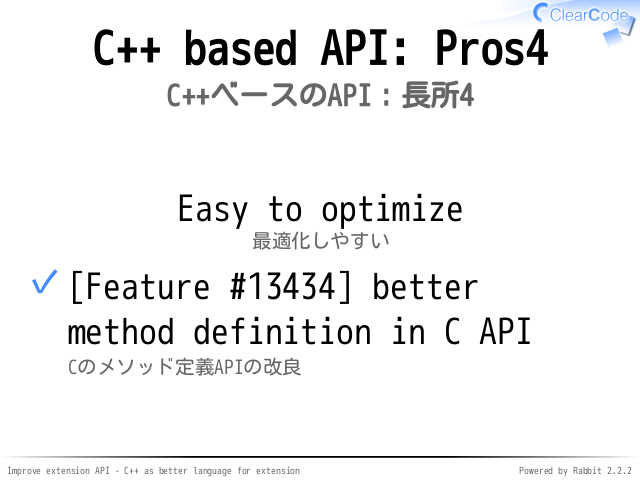 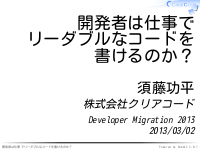 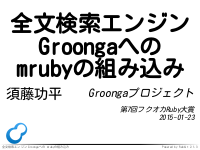 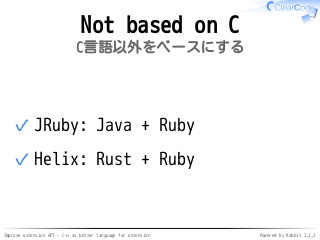 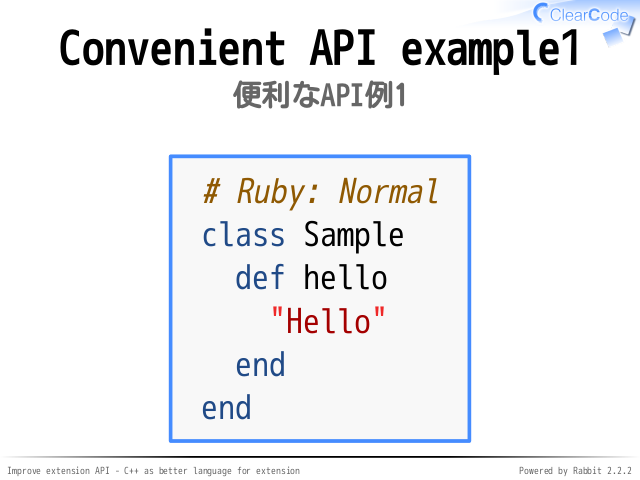 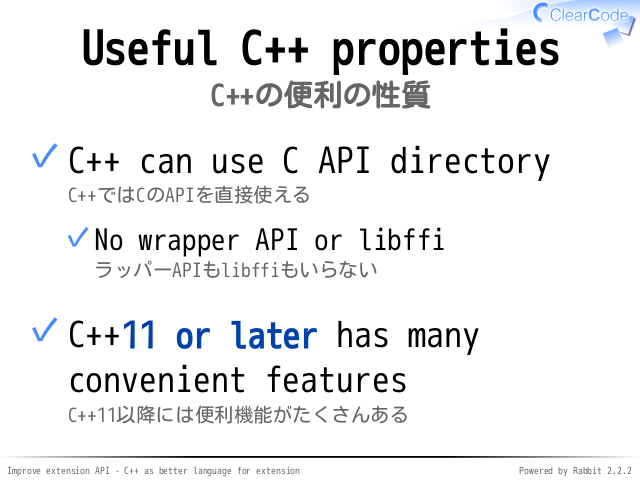 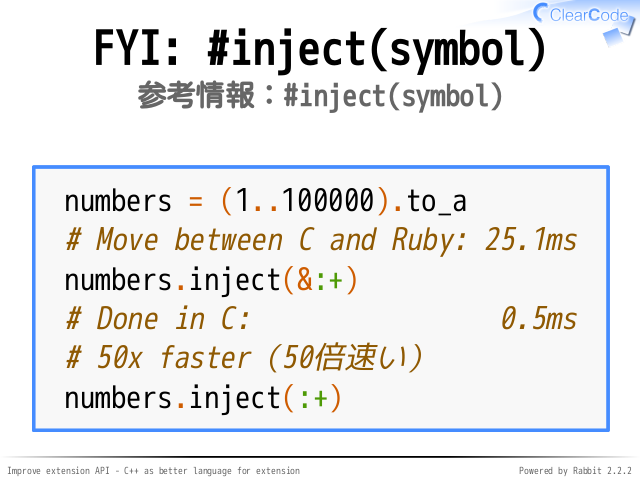 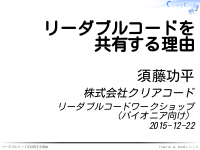 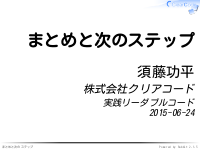 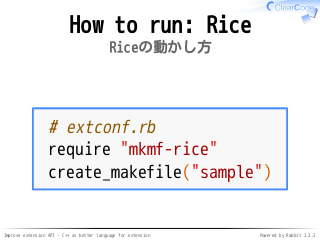 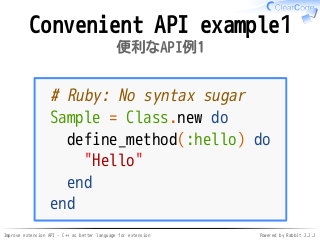 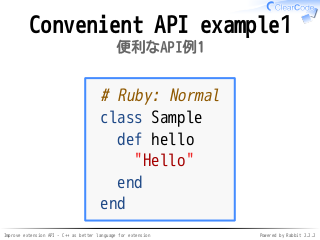 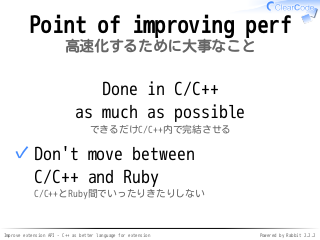 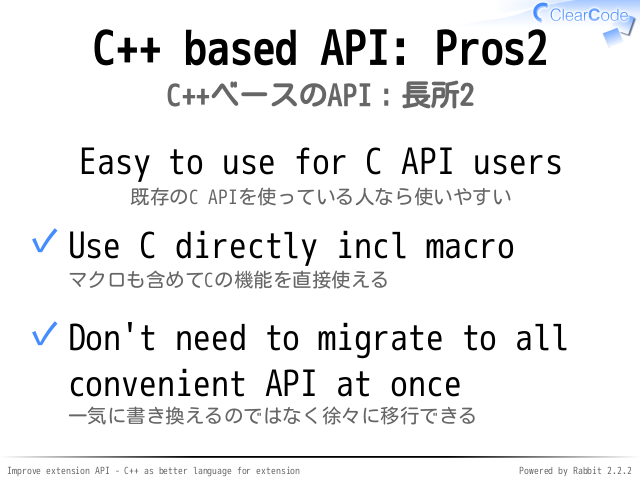 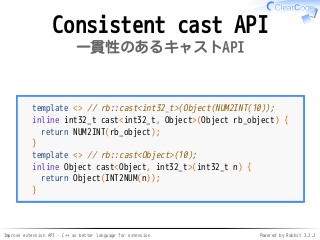 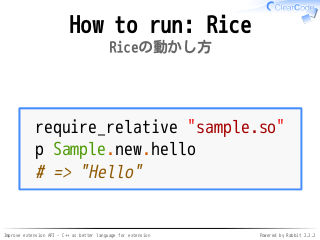 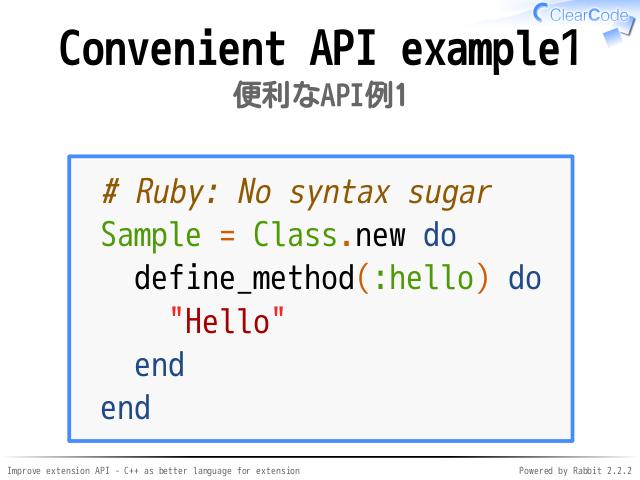 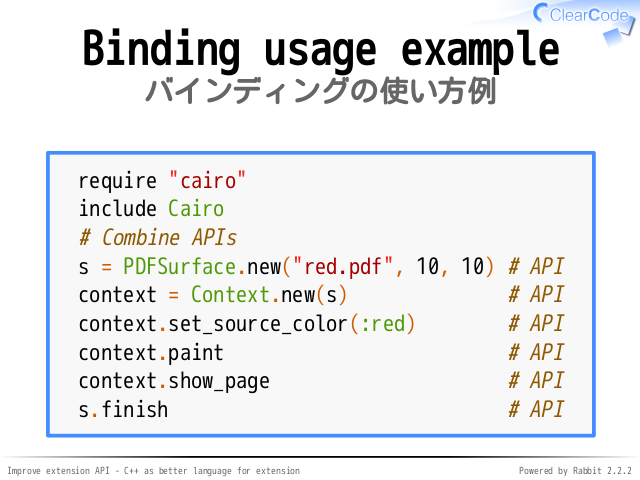 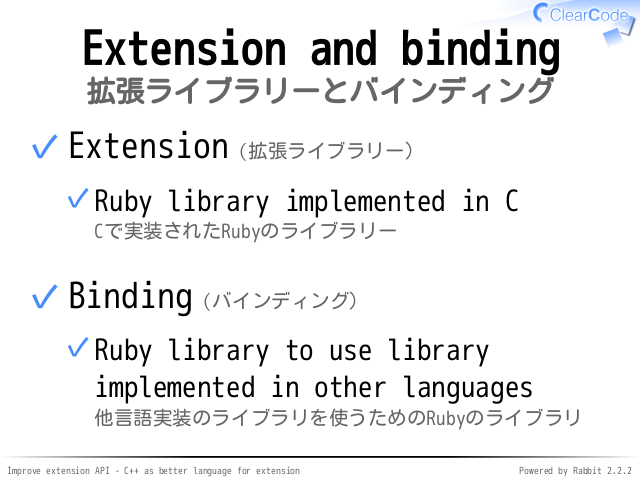 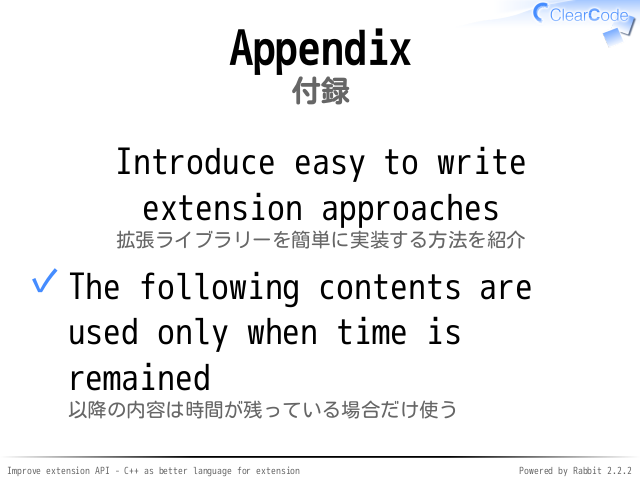 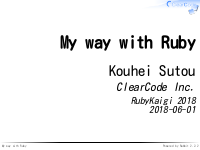 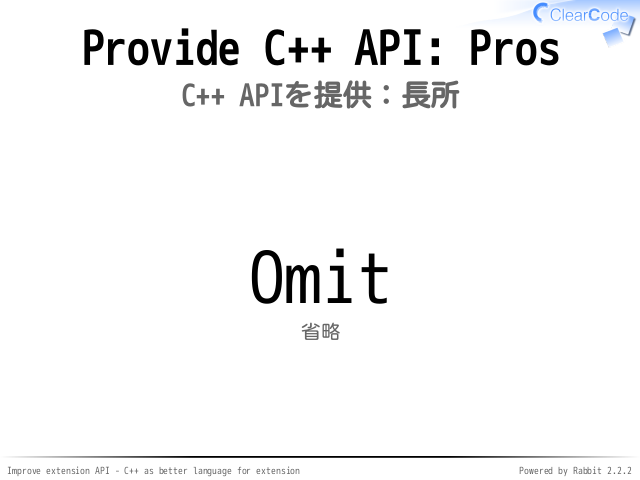 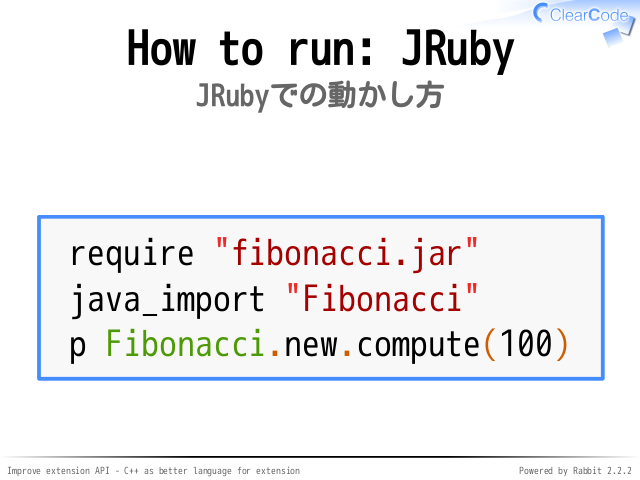 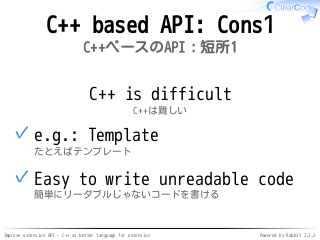 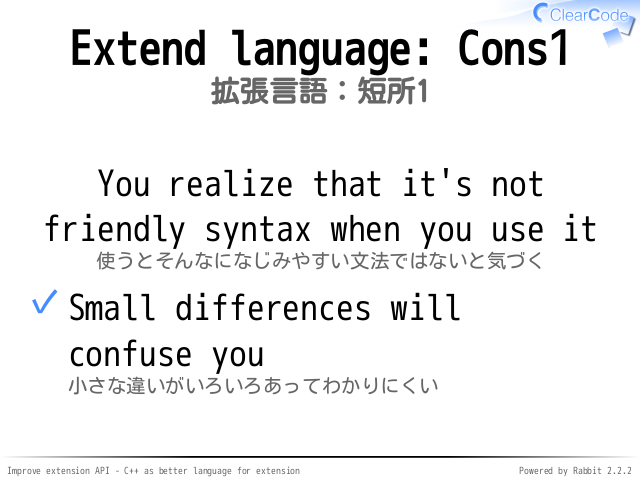 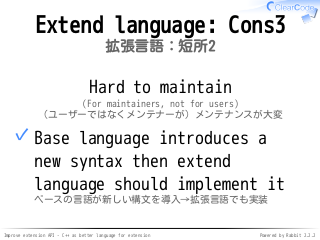 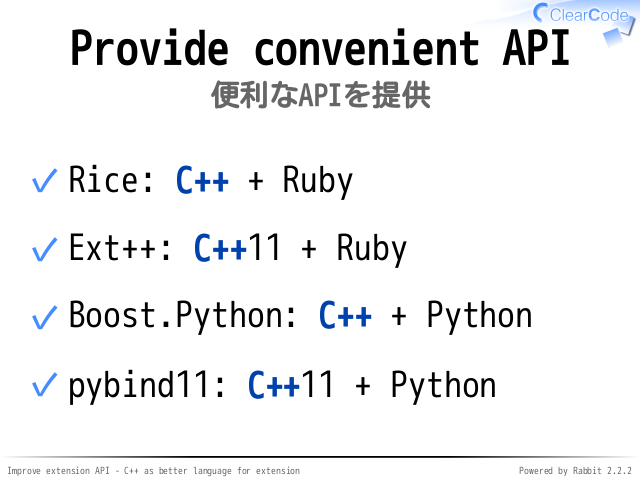 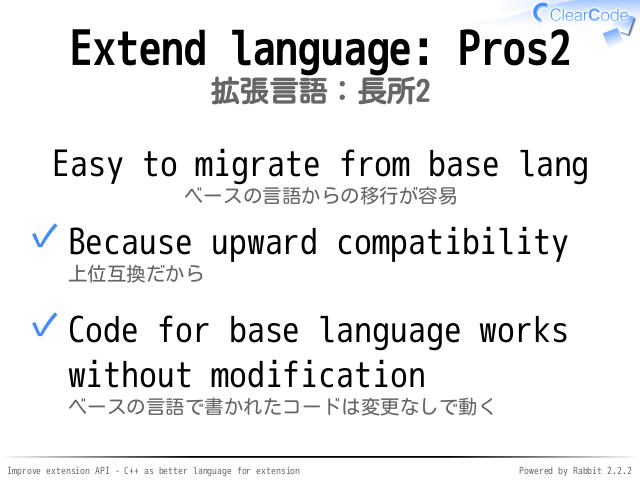 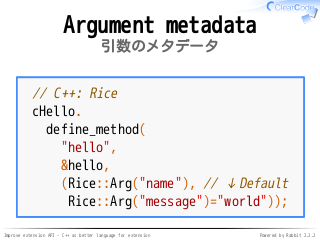 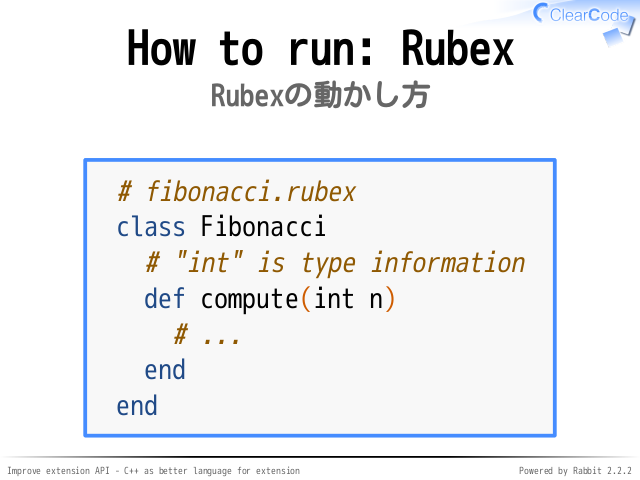 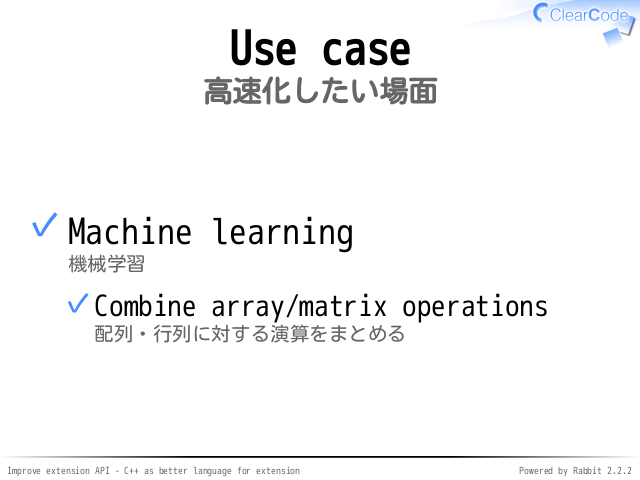 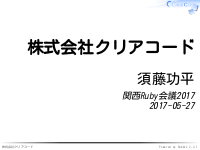 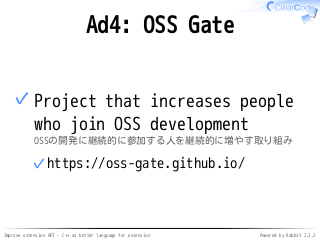 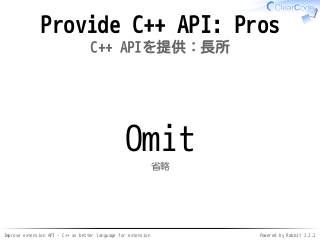 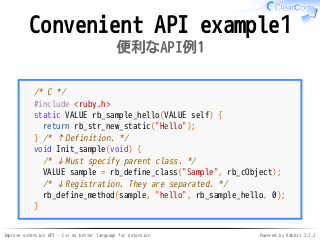 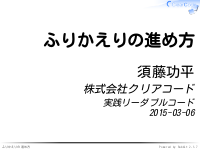 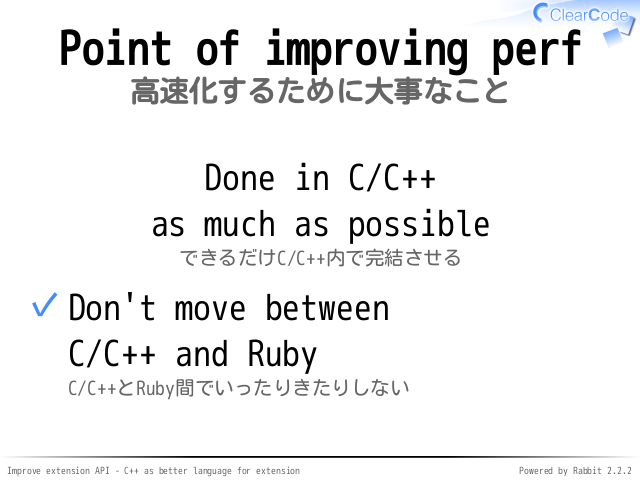 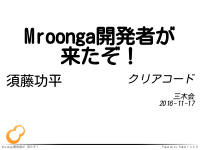 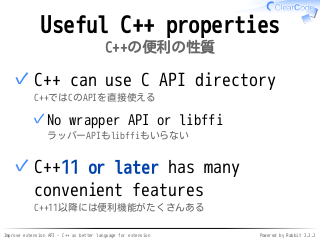 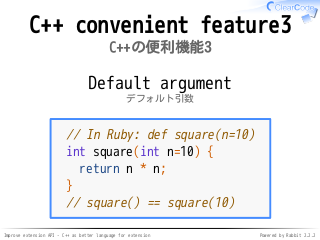 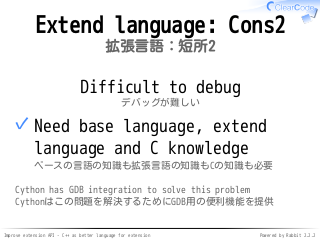 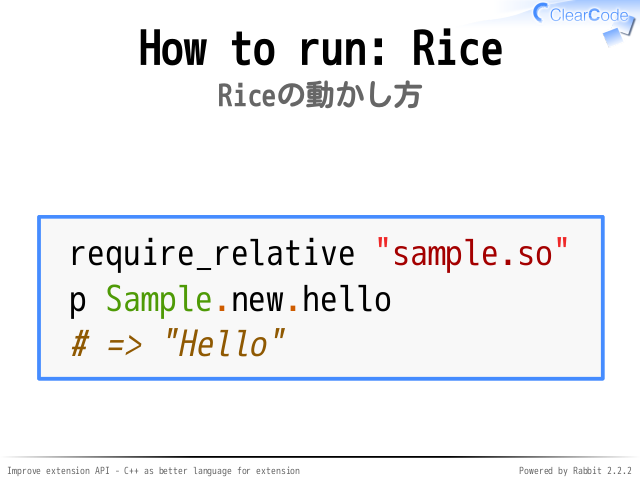 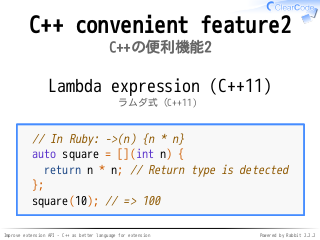 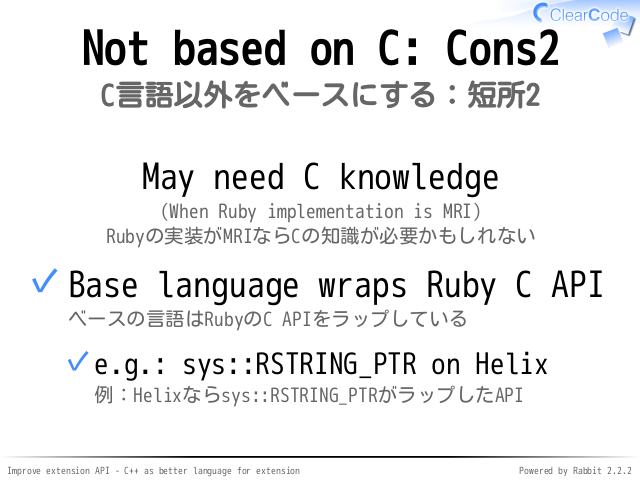 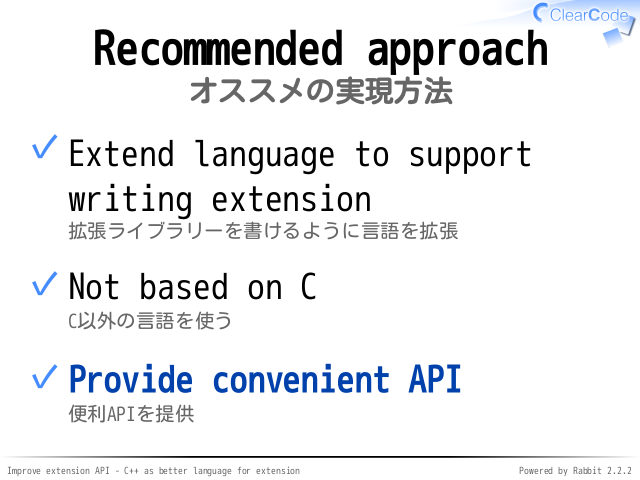 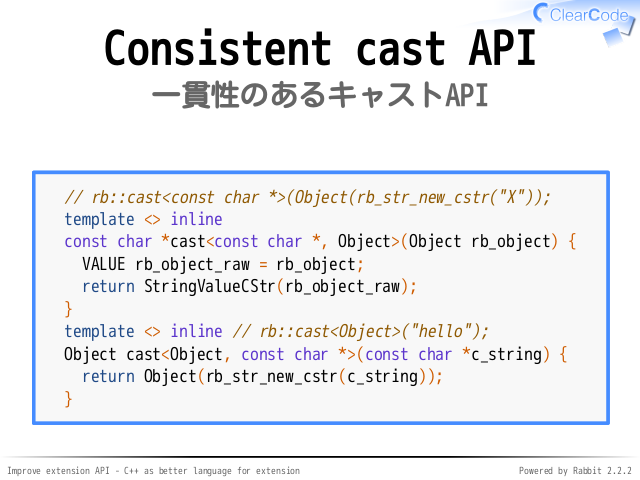 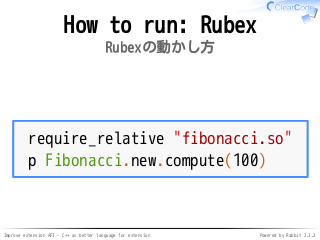 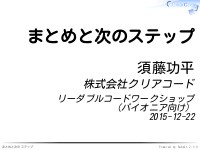 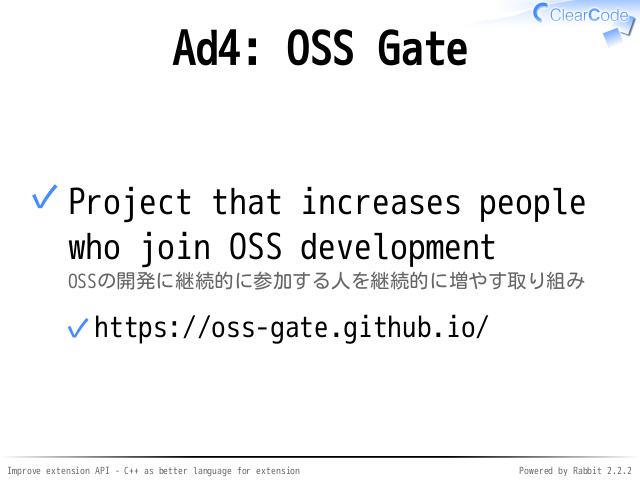 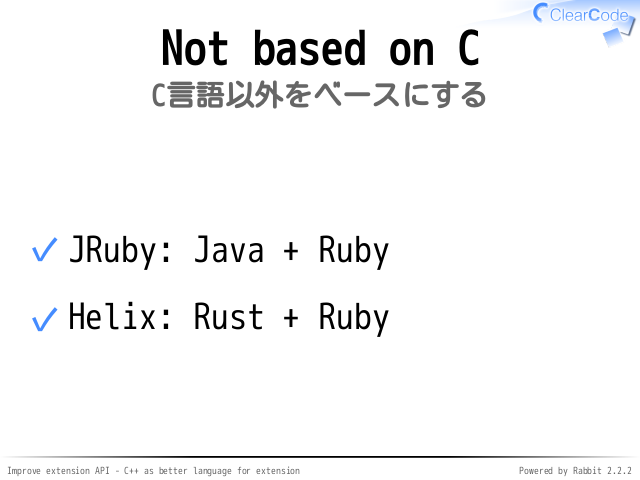 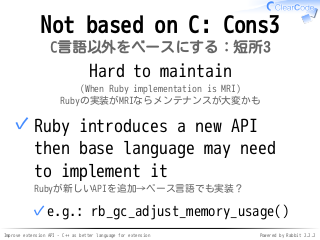 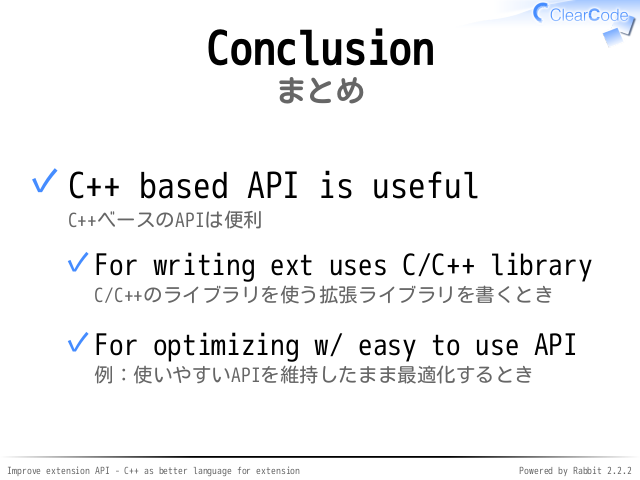 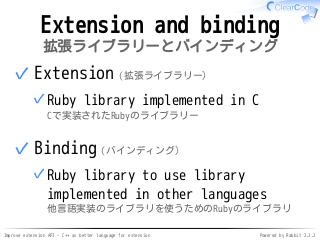 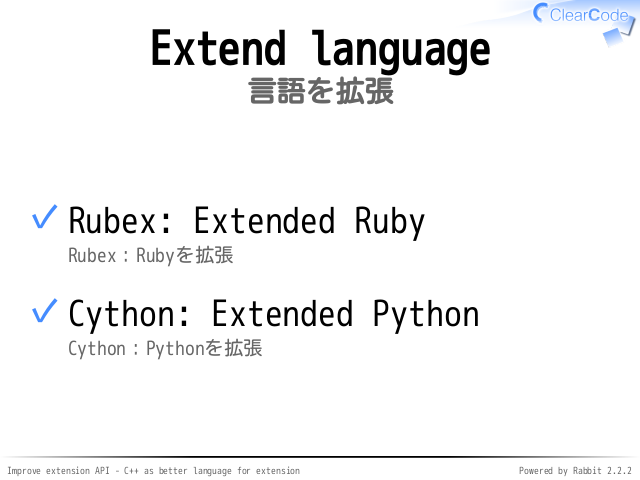 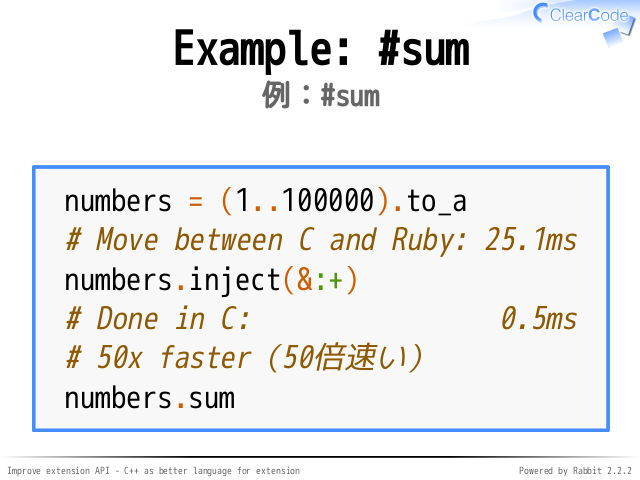 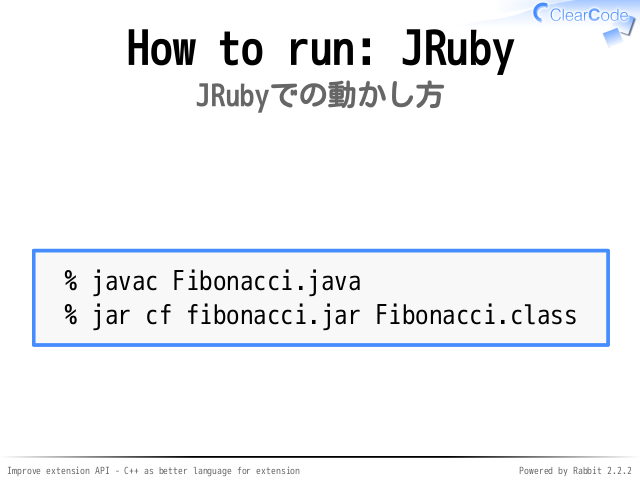 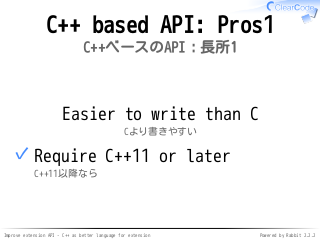 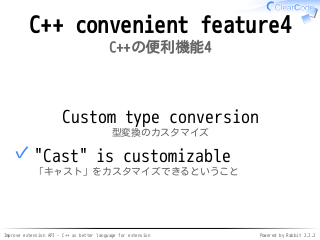 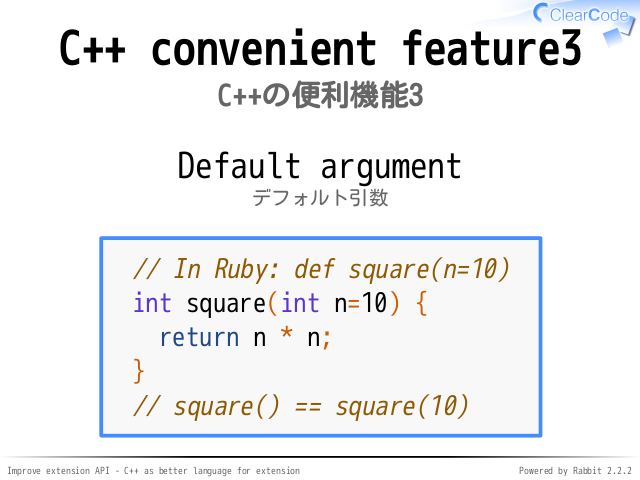 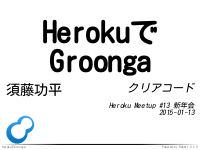 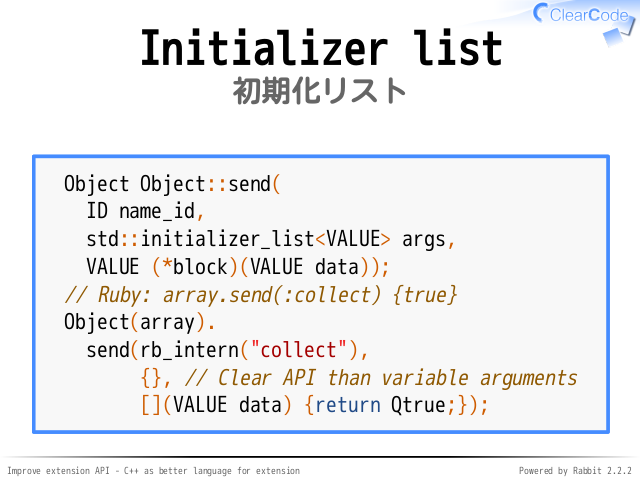 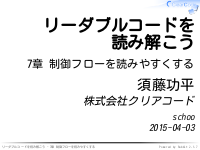 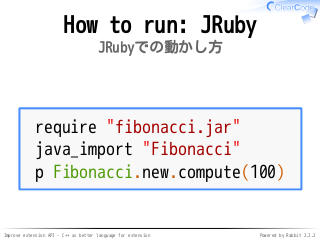 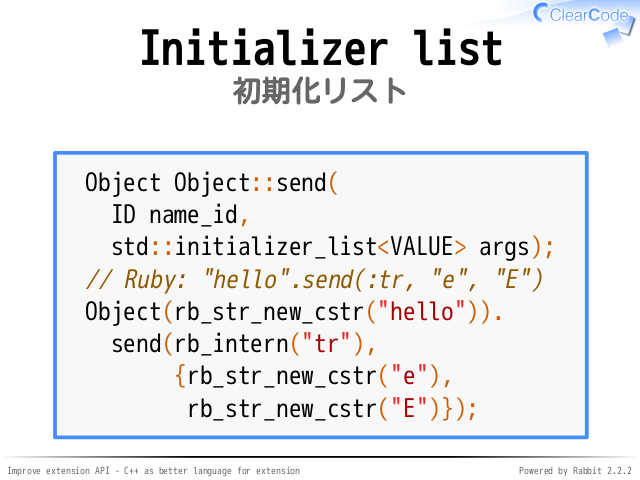 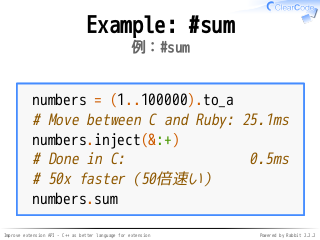 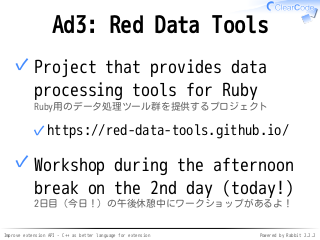 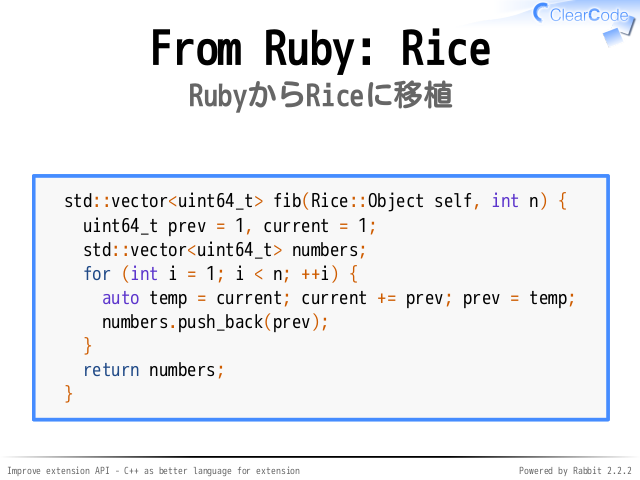 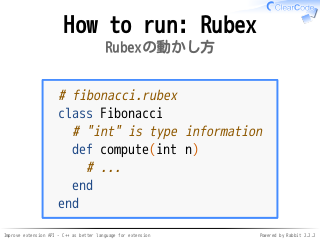 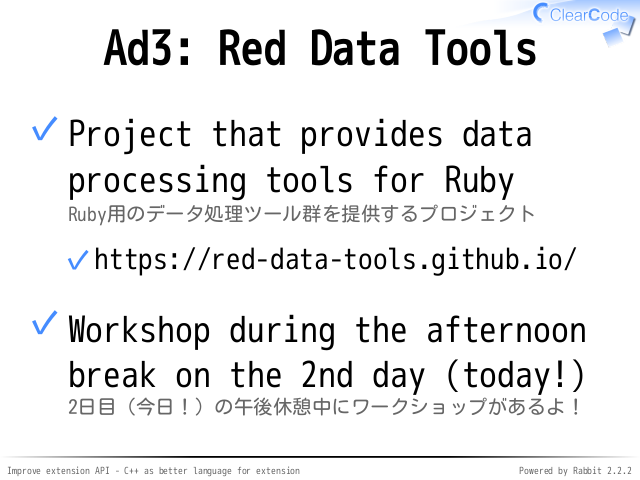 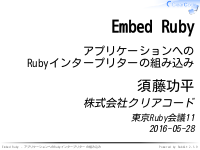 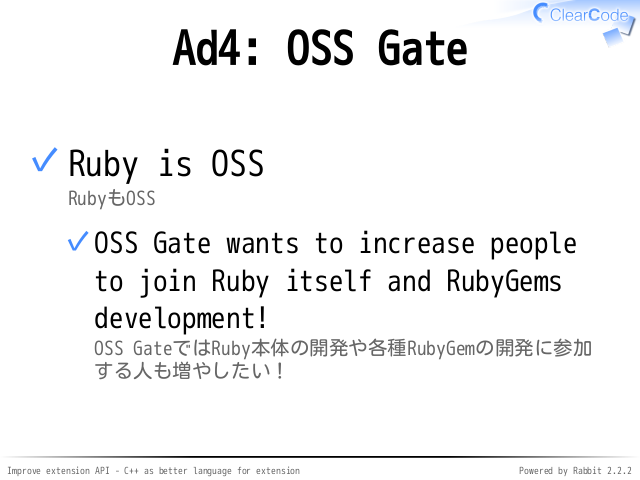 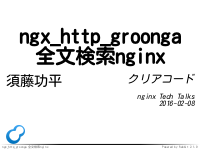 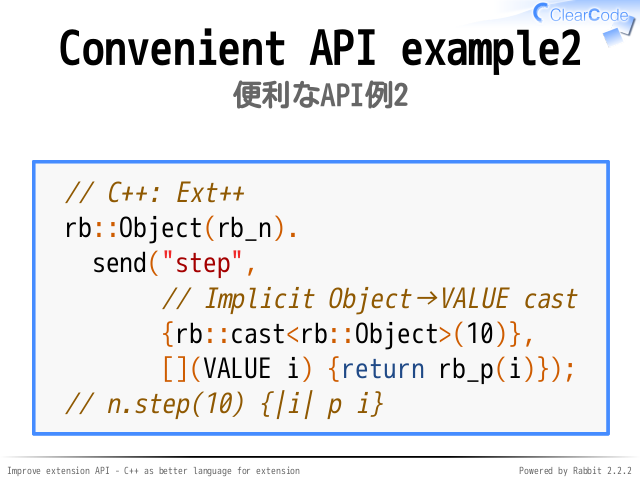 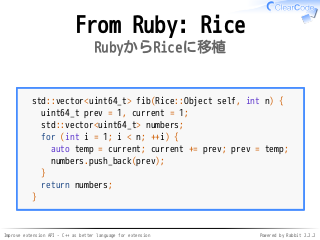 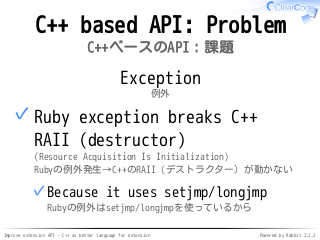 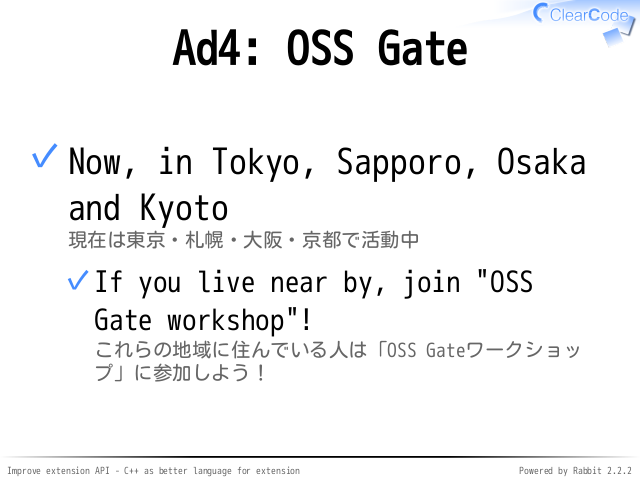 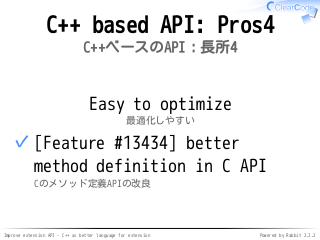 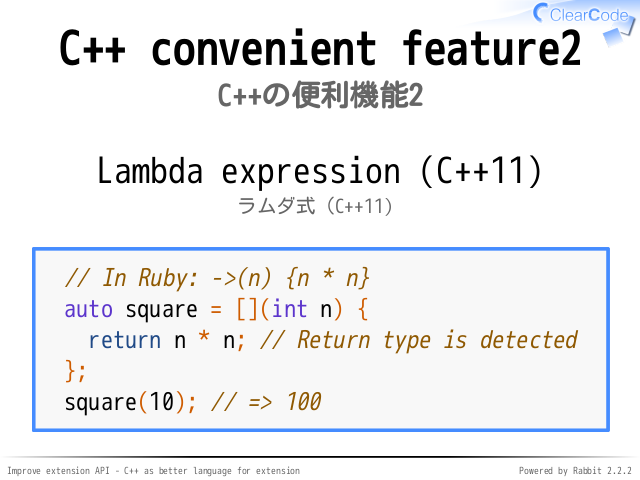 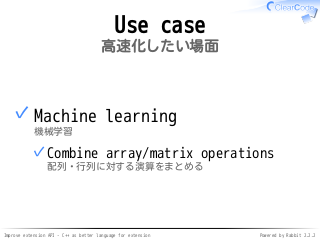 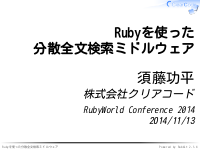 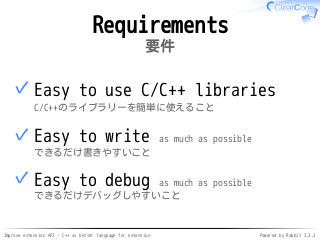 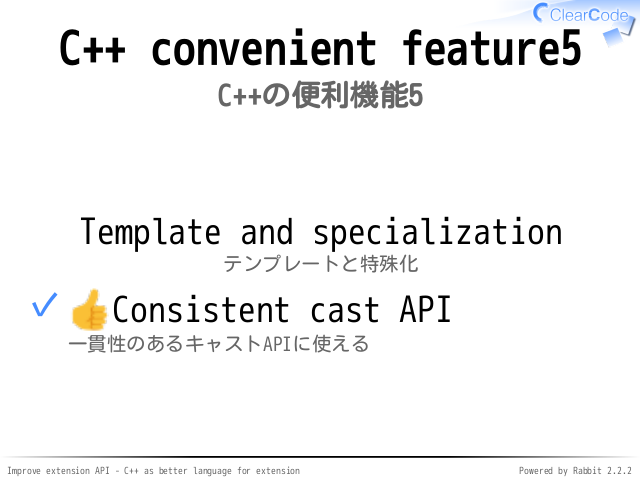 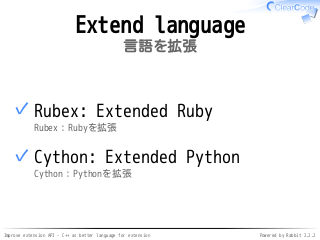 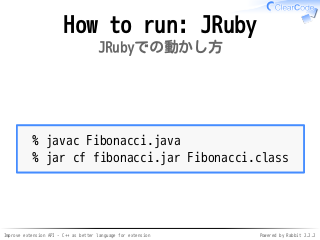 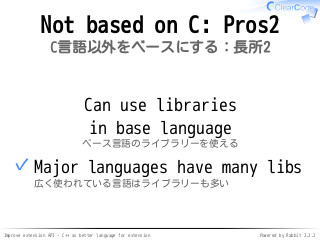 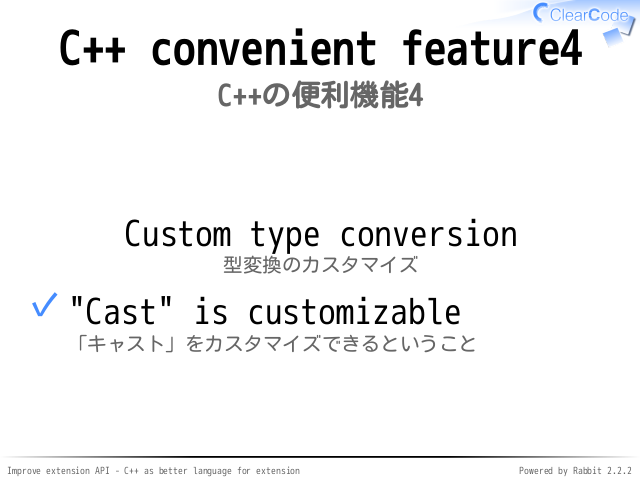 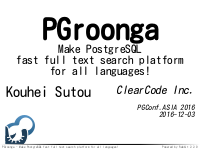 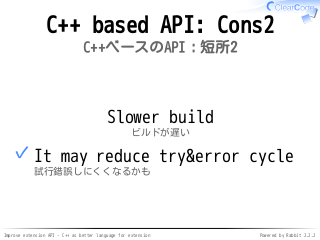 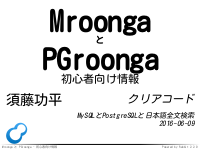 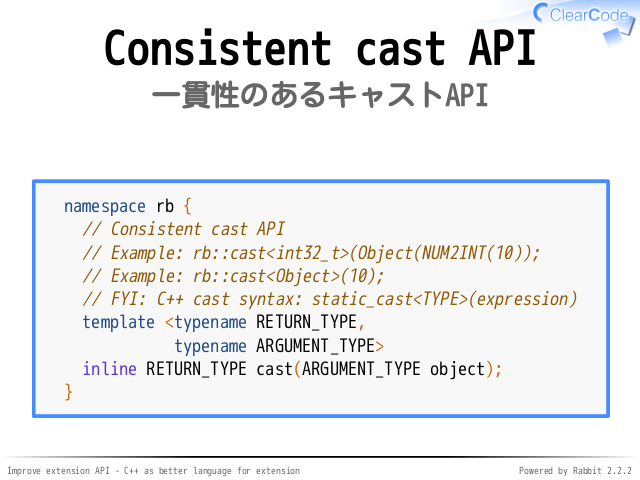 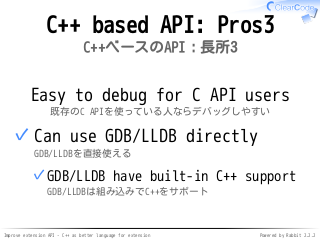 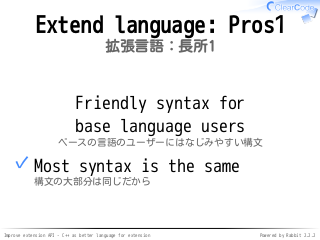 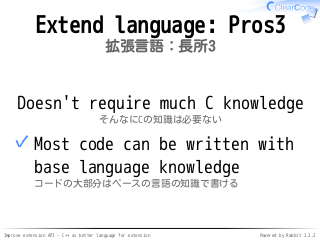 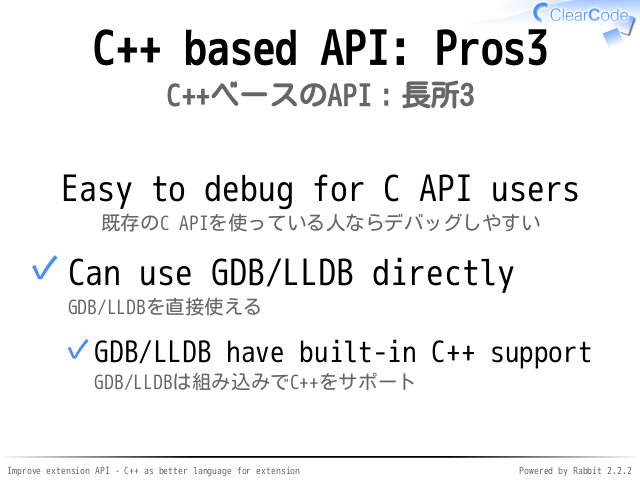 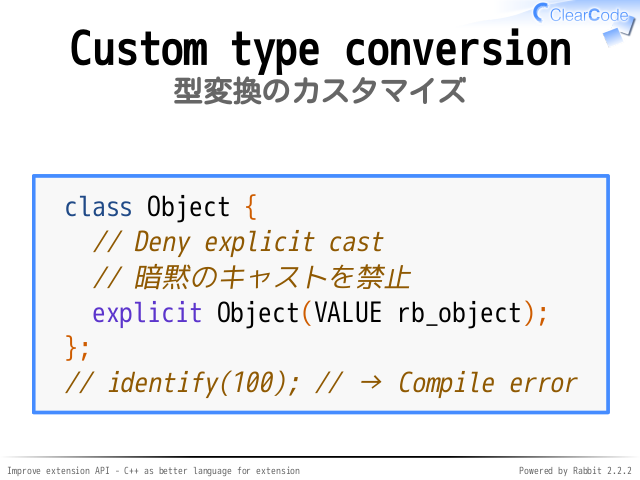 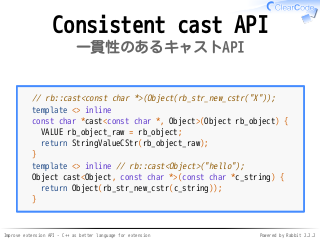 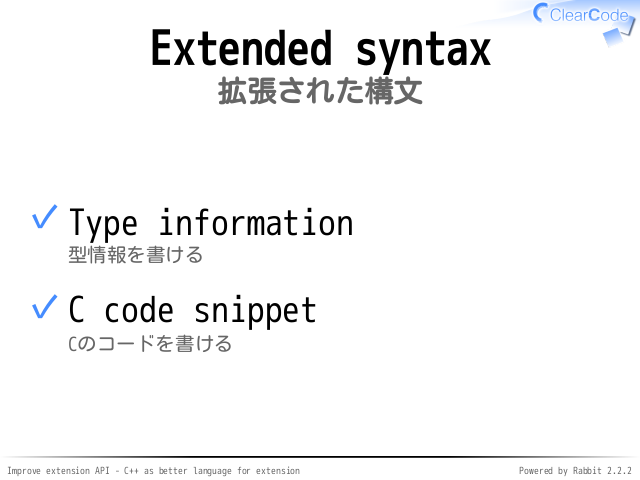 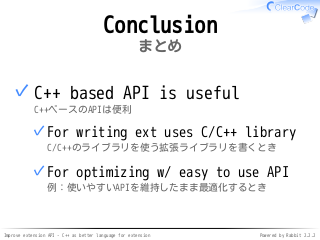 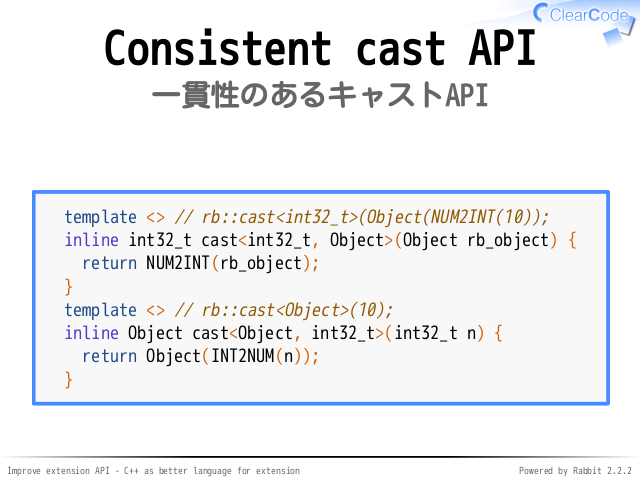 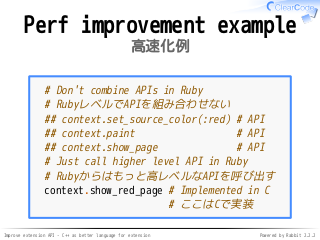 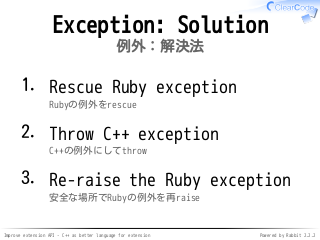 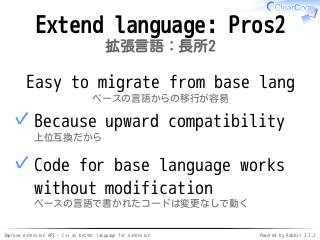 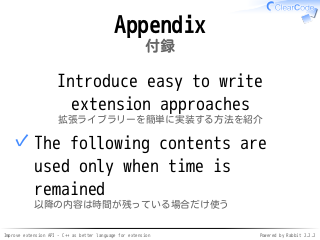 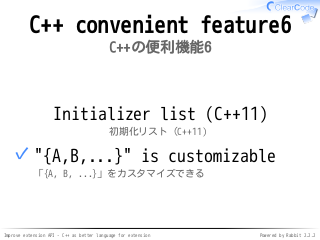 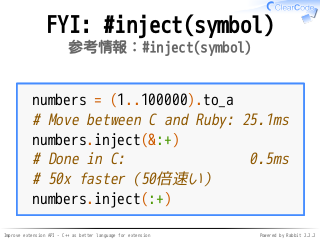 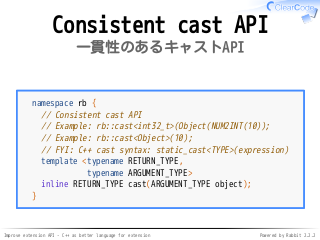 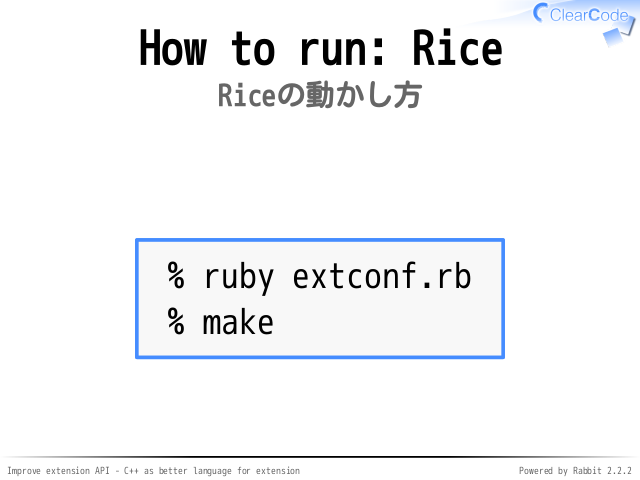 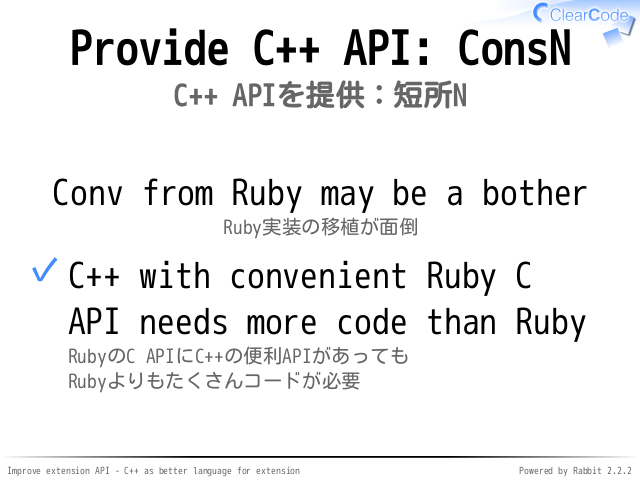 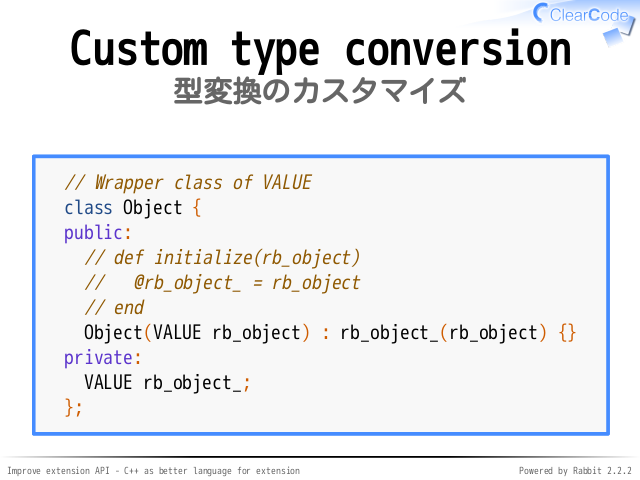 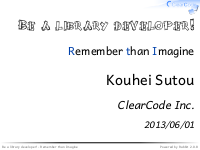 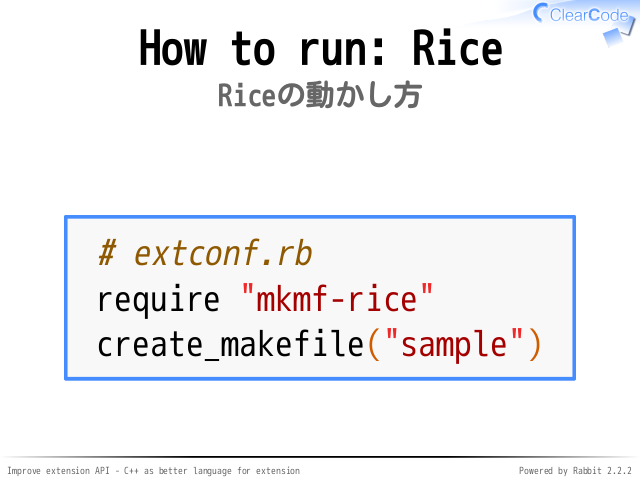 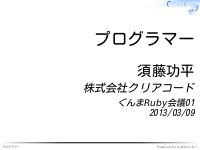 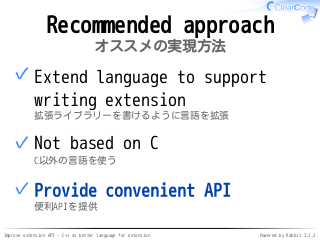 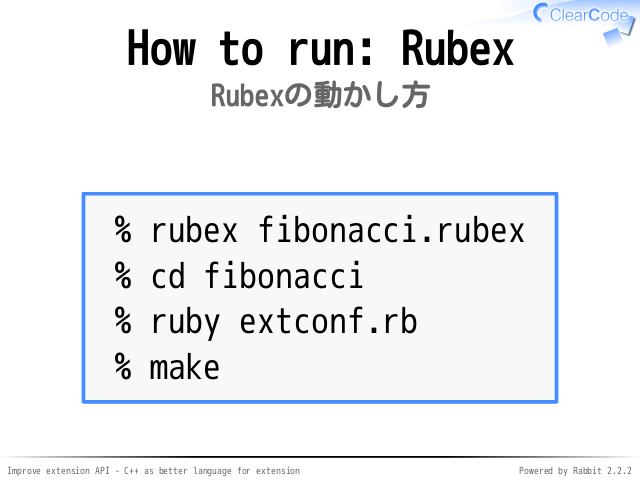 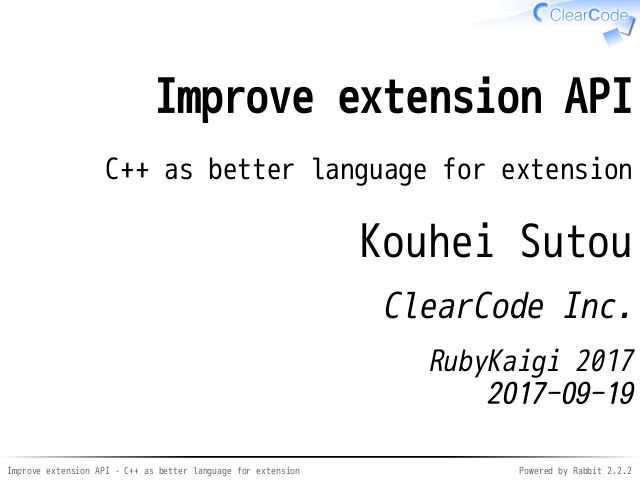 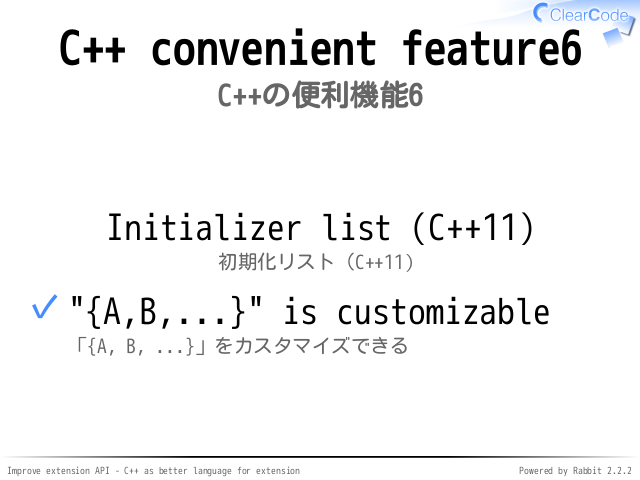 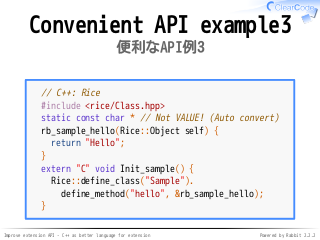 Ruby's extension API is for C. This talk proposes C++ as a better language for extension API. 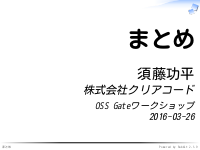 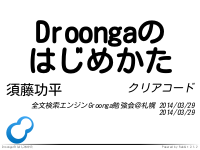 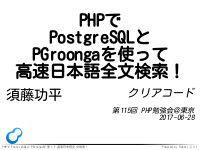 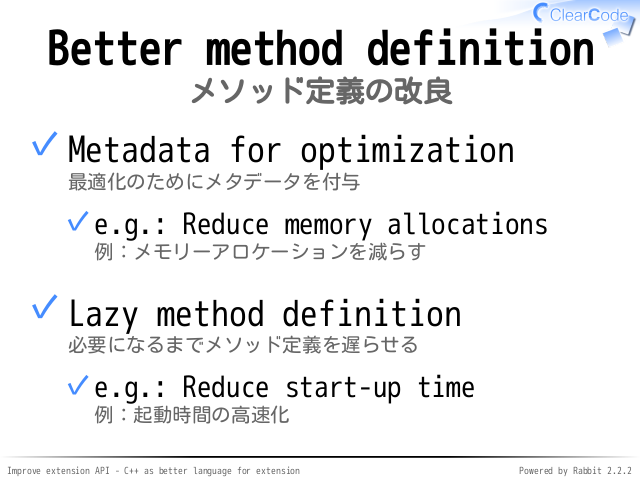 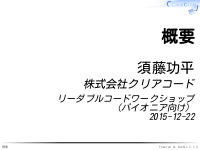 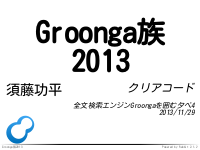 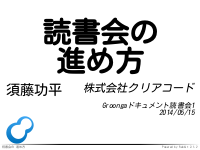 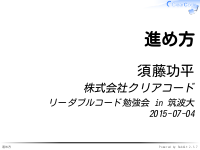 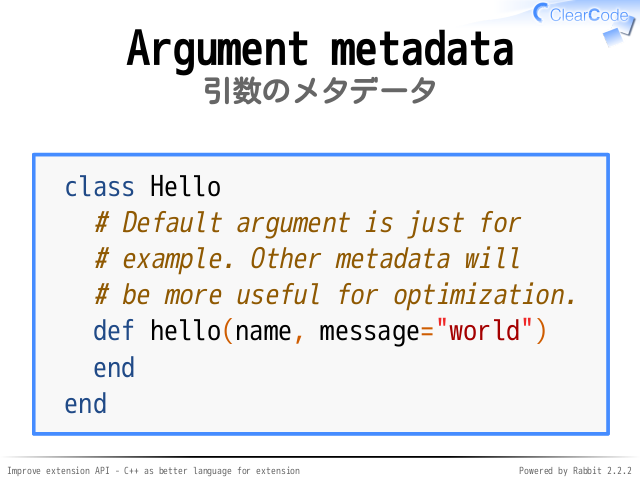 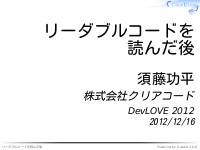 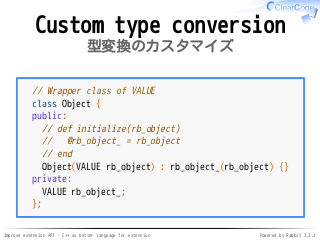 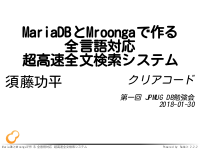 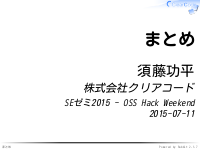 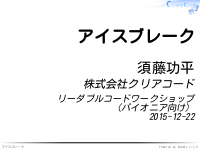 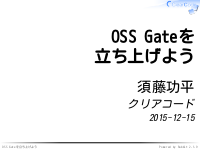 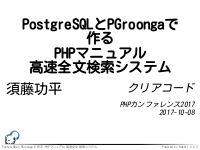 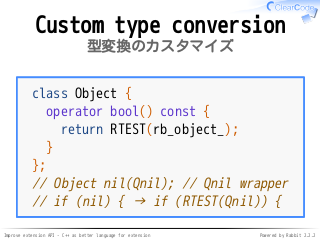 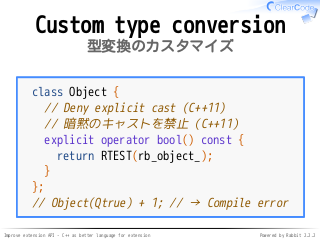 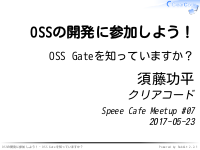 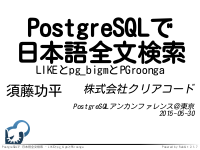 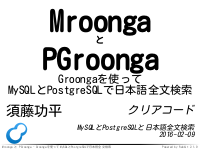 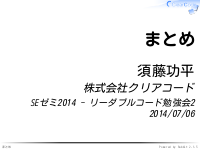 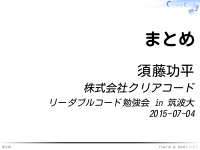 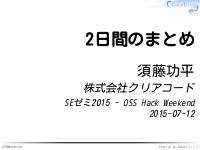 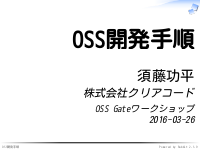 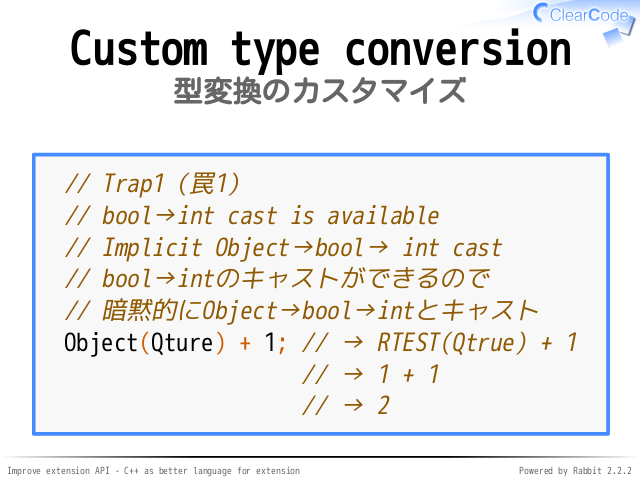 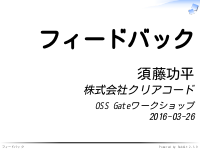 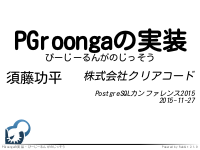 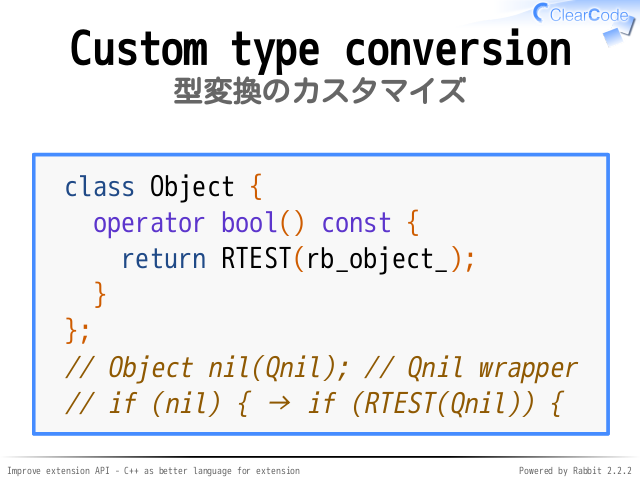 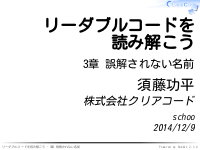 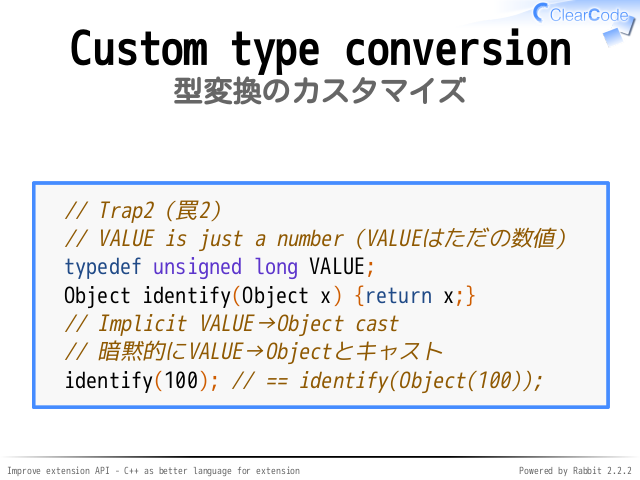 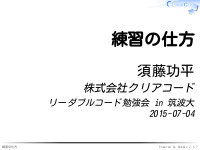 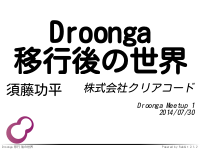 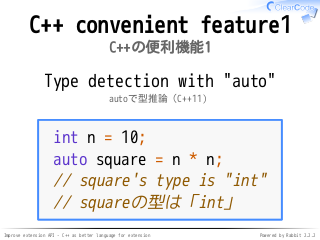 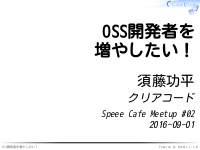 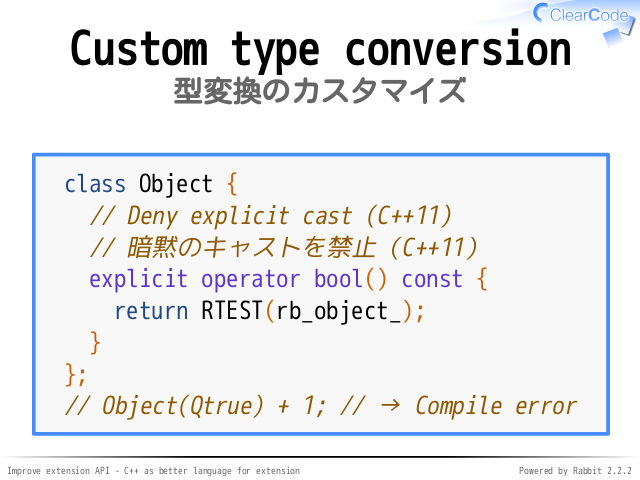 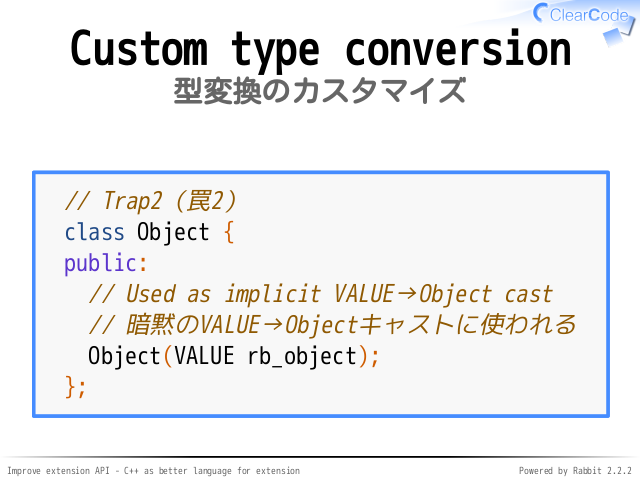 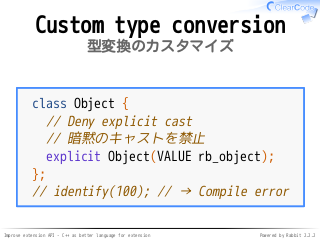 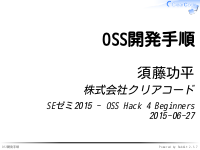 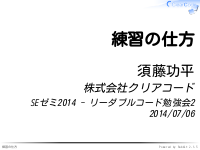 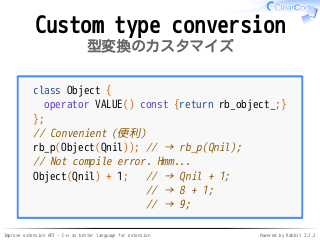 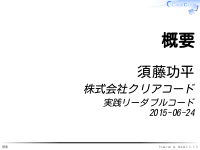 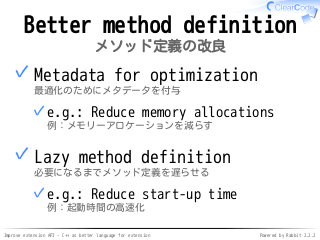 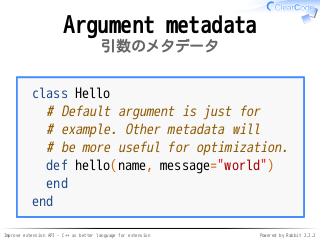 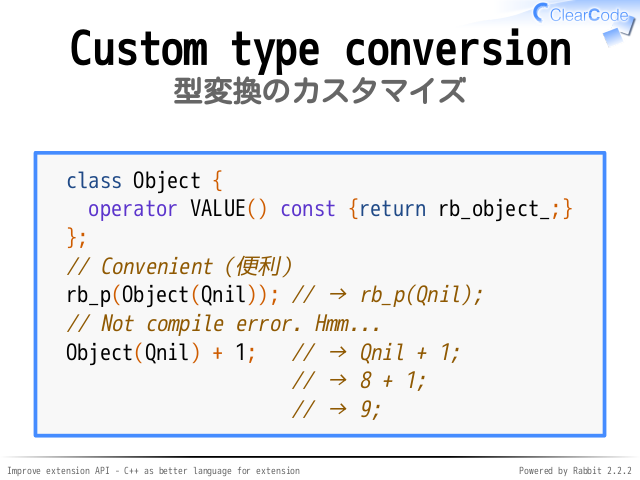 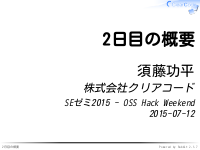 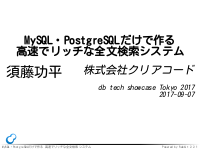 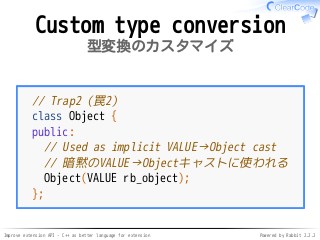 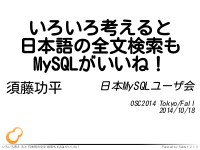 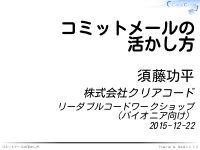 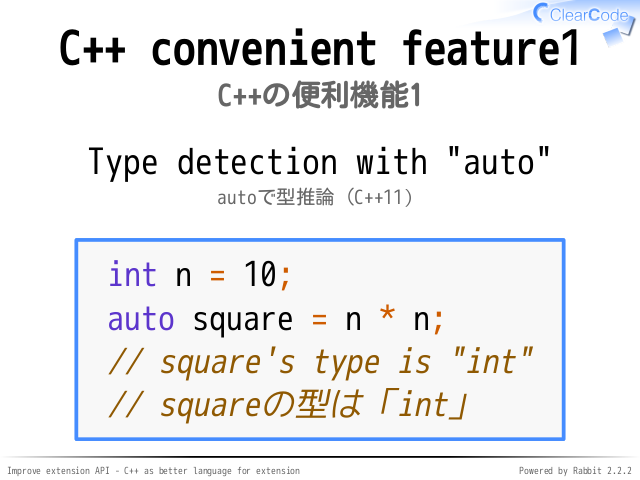 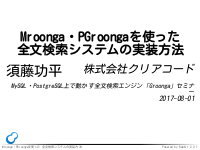 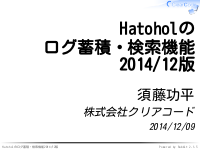 // square's type is "int"
# be more useful for optimization. 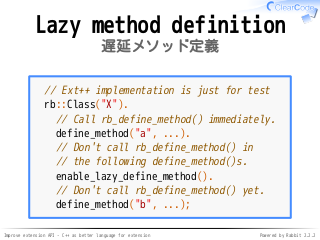 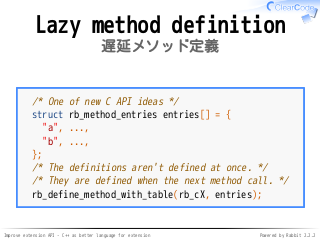 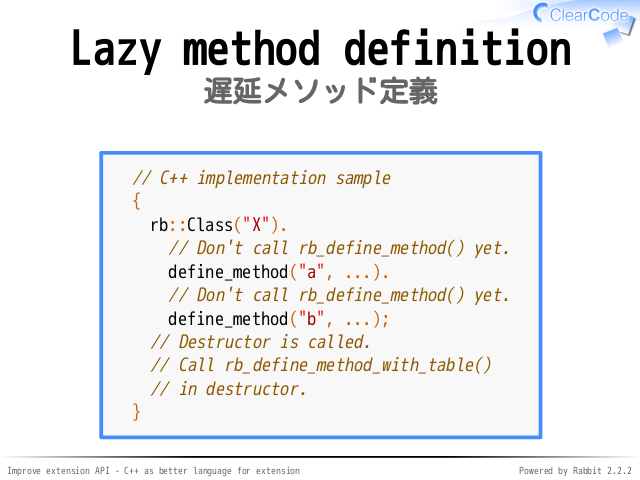 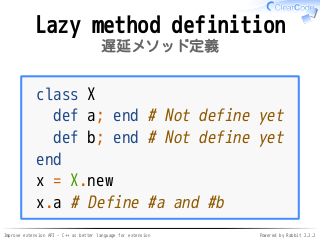 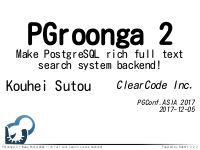 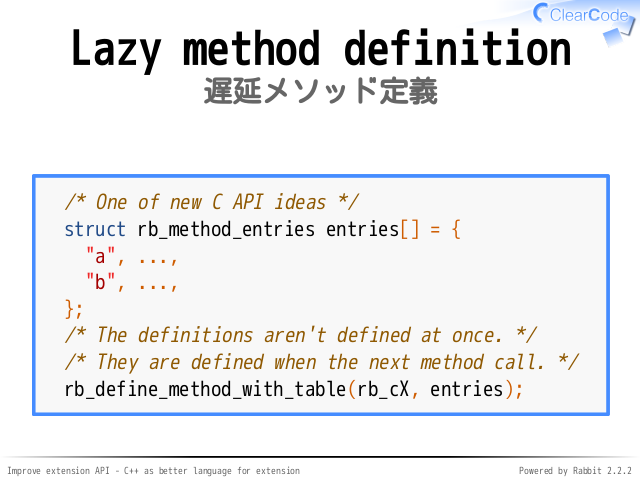 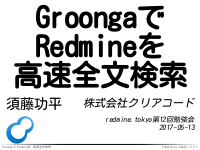 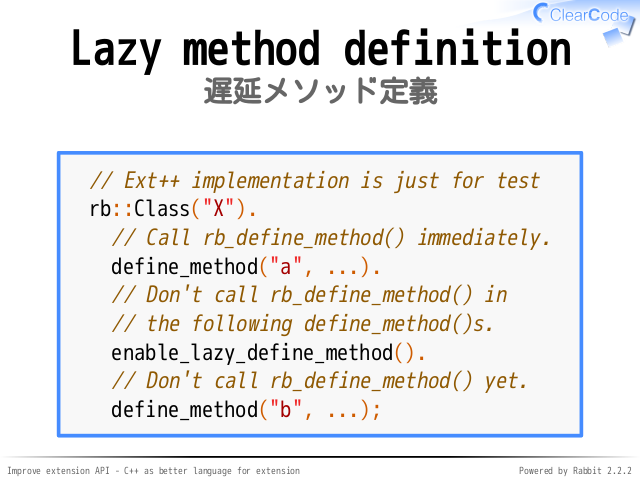 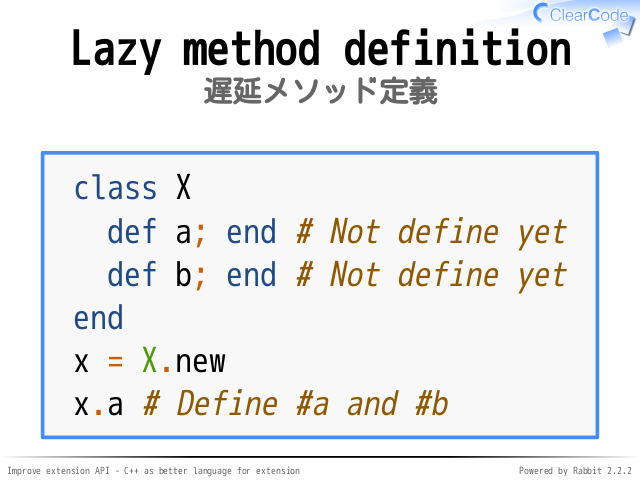 // Don't call rb_define_method() yet. 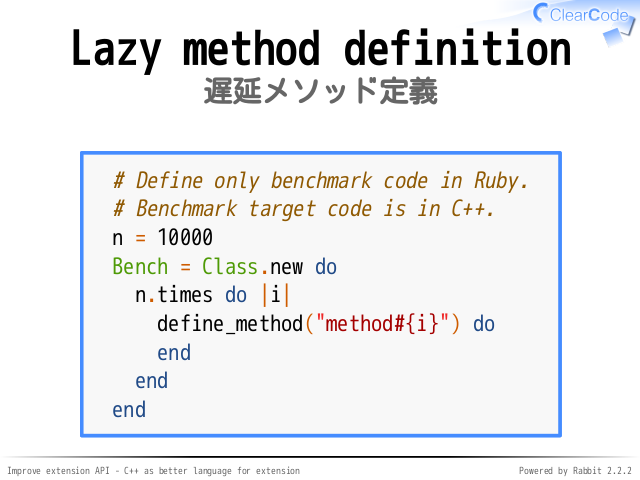 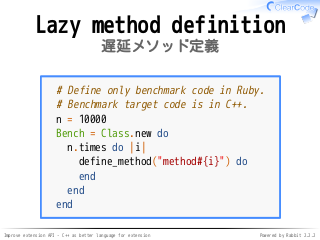 # Define only benchmark code in Ruby. 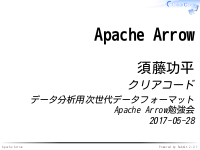 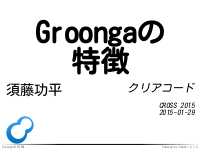 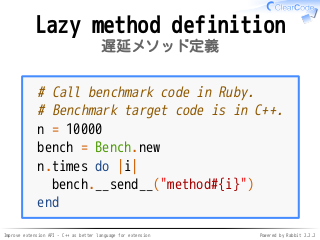 # Benchmark target code is in C++. 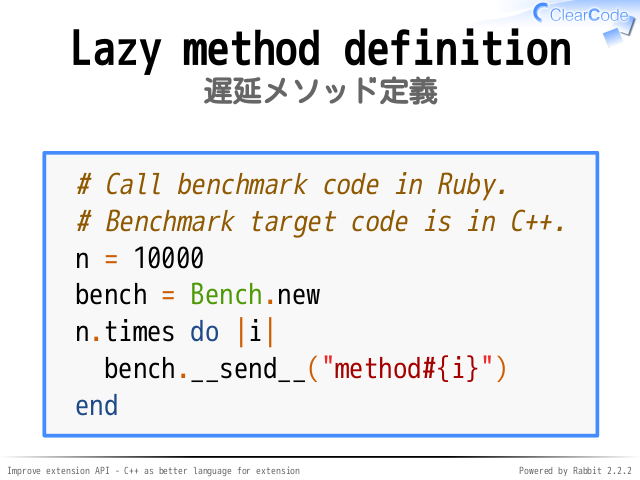 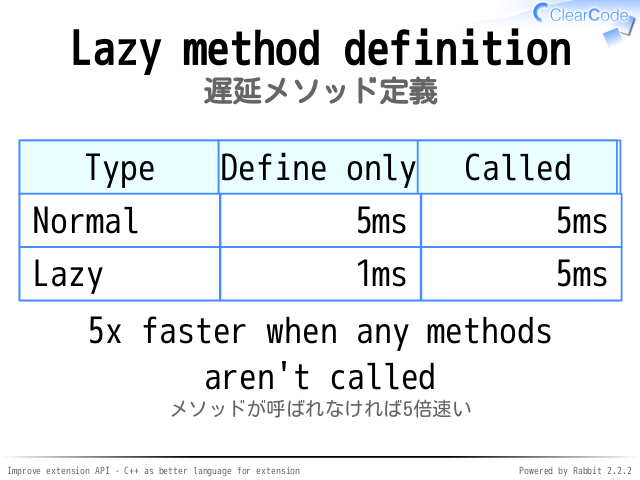 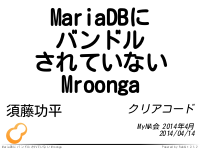 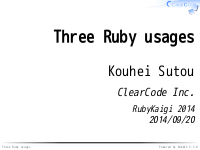 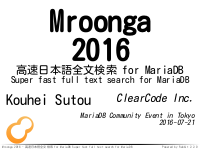 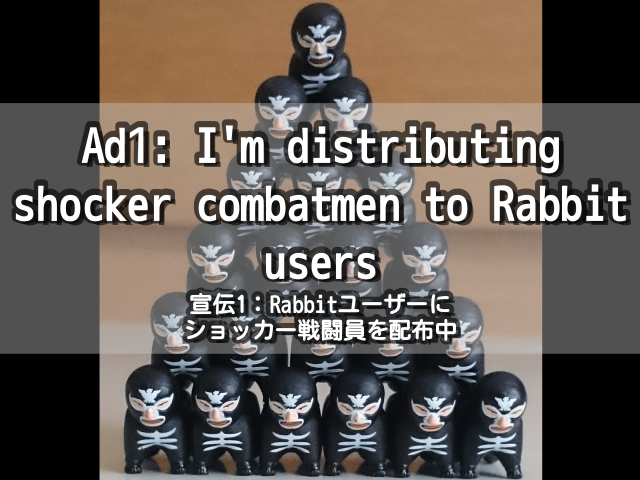 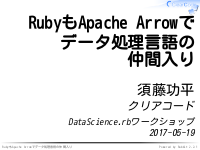 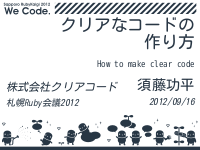 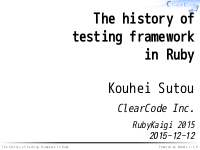 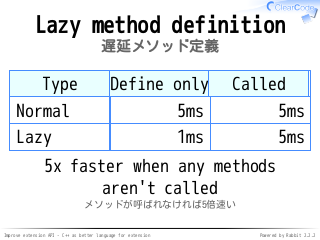 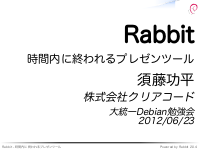 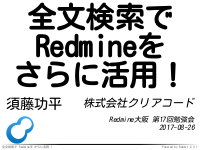 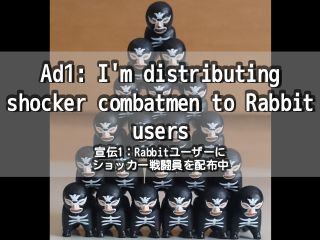 # Call benchmark code in Ruby. 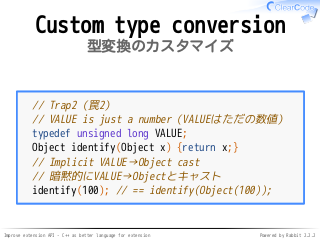 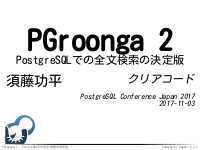 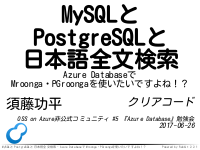 static const char * // Not VALUE!